L-R: Svein "Løva" Andresen, Ronald Pedersen, Finn Pedersen, and Bjørnar Jørgensen. 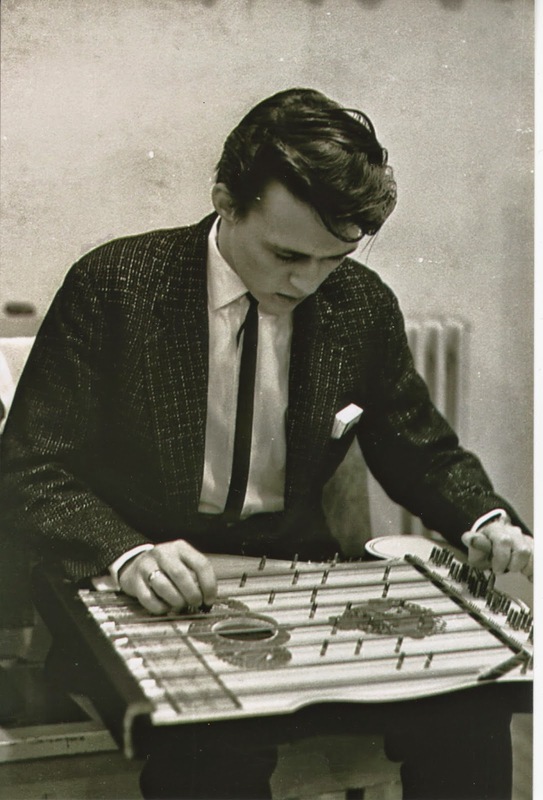 Finn Pedersen used a (British) Burns VibraSlim guitar, plugged into a very rare (Danish made) MAX Forty amplifier that was fed into it's proper MAX Forty speaker cabinet. Finn Pedersen: "I have tried many times to find me another MAX Forty amp, but unfortunately without any luck. It was an amazing combination together with my Burns VibraSlim: The best sound ever!" 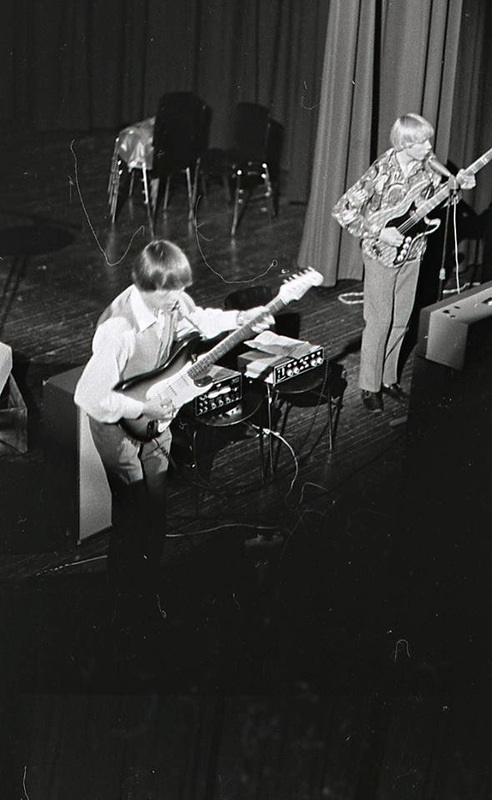 Ronald Pedersen was using an (American) Fender Stratocaster that was plugged into a (British) Selmer amplifier / Selmer speaker cabinet. 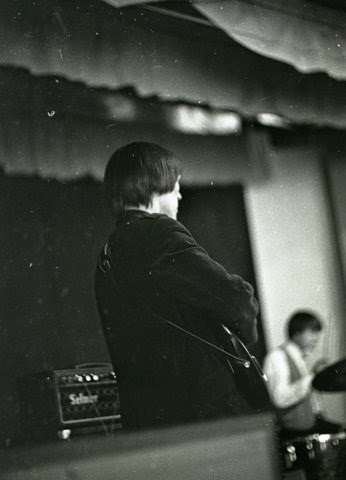 Svein “Løva” Andresen used a Höfner bass connected to a Selmer bass amp, along with Selmer speakers. 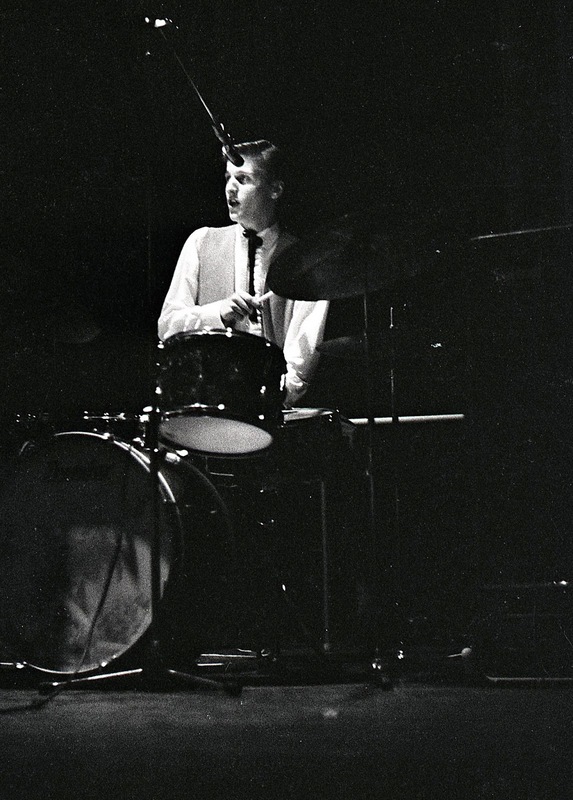 Bjørnar Jørgensen deftly banged the skins on Sonor drums. 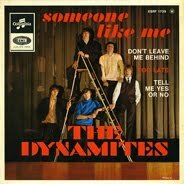 The Zaks were using a PA made by Dynacord for the vocals, that was connected with two UK-made Selmer speaker columns. Finn would usually sing into a Dynacord microphone, while the other three band-members for the most part used their three Shure SM57 microphones. Vardø (or “Wolf Island” in old Norse-speak), is a small arctic town arguably most notorious for its gruesome witch trials during the 1700’s at Vardøhus Fortess, and was also recognized as one of the places that the judicious and holier-than-thou sages stated was the location of one of the 7 gateways to Hell on Earth. This Nordic equivalent of Salem, MA is the Easternmost town in Europe (its farther East than Istanbul and St. Petersburg) and is along with Hammerfest the oldest city in Northern Norway (they both received city-status in 1789). The city, which is the oldest known fishing-harbor in Finnmark county (the largest, Northern-most and least populated county of Norway), and which today consists of approximately 2000 inhabitants over a relatively small, seemingly sleepy, desolated area, is hardly a place any outsider would consider being a cultural breeding ground with a rich cultural heritage dating back for at least a dozen of centuries. 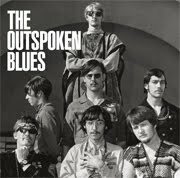 Nevertheless, it was (and still is); and as listeners are about to discover; - 60’s rock’n’roll was a part of that hotbed. But before the mop-top-sound invaded that particularly cold corner of the Earth, the only music you had to go by was the standard accordion-based pre-war dance-songs, which seemed to be omnipresent in just about every settlement along the Northern coast at the many diverse gatherings. With cultural mainstays and media primarily concentrated and thriving in the big cities in the Southern part of Norway, a cultural divide up to the still war-ravaged, remote and hard-to-reach Northern areas was a reality. Northerners were also branded as rough-hewn, foul-mouthed counterparts as opposed to their more “refined” Southern cousins. 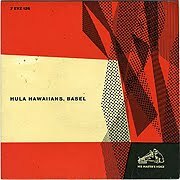 Nonetheless, as was usual for a sea-faring nation, locals having been abroad returned home with the strangest-sounding records from all over the globe, presenting the ever-curious youth living in small and isolated areas to the shape of things to come. Suddenly something started to stir in the midst of the post-war generation. And Vardø-teens were certainly not an exception to that rule. The Lovers a friendly '60s beat band from Vardø, that used to share some concerts with The Zaks. 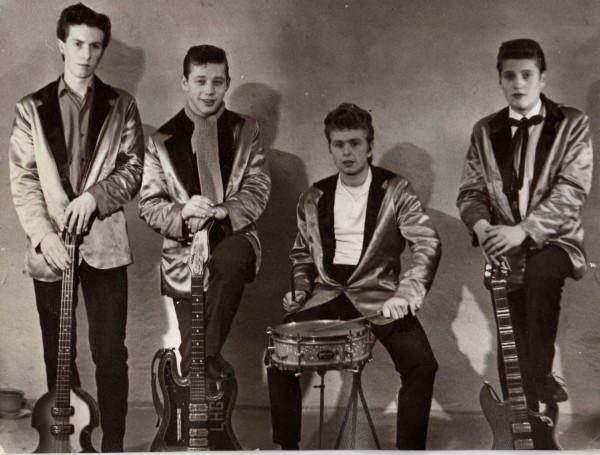 This brings us to one of Scandinavia’s most hidden 60’s Rock-assets…The Zaks. The 60’s also saw the formation of other Vardø-bands like The Sunlights, The Powder Lovers, The Lovers, The Nuts and The Minors;- but The Zaks was the best, the biggest, and the loudest of the bunch, and the only ones who actually managed to record in a professional studio. 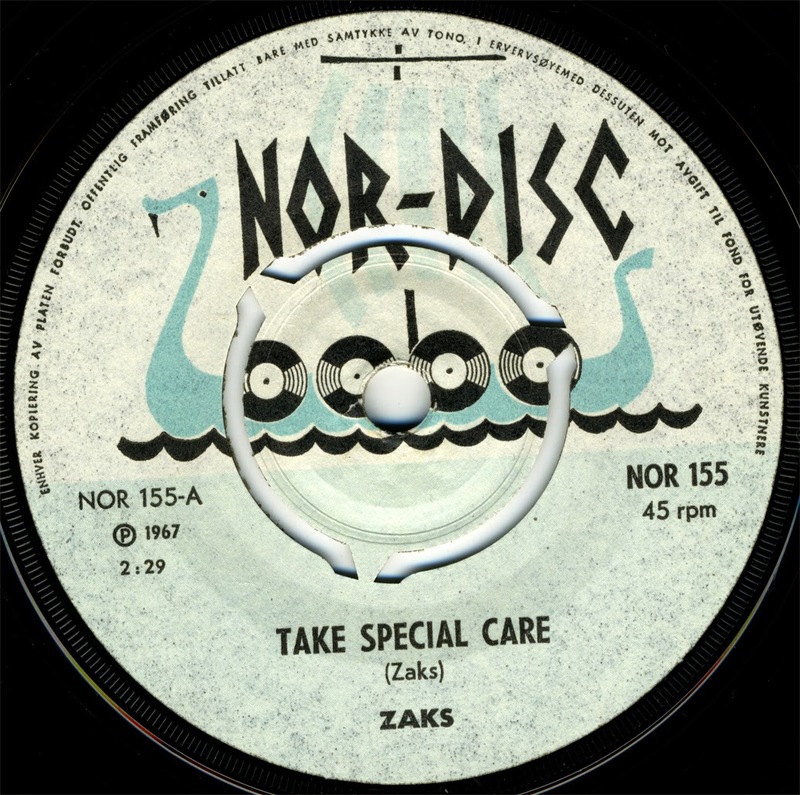 The Zaks were part of a small but important horde from the Northern scene which consisted of bands like The Pussycats (Tromsø), The Wizards (Narvik), The 1-2-6 (Bodø), The Few (Bodø), The Modsmen Sect (Tromsø) and The Scavers (Kirkenes), just to name a few. 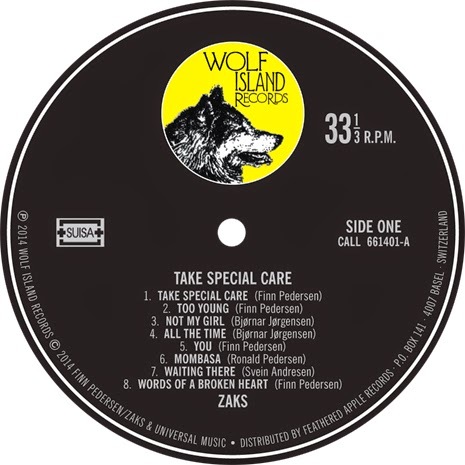 Today, they’re revered by 60’s collectors world-wide as the band behind the extremely rare and sought after 45 “Take Special Care” BW “Too Young” from 1967, released at a point when the group’s career just seemed to be about to take off after having attained a renowned standing after years of incessant work and rigid touring; but which ended abruptly due to the “usual” unlucky circumstances that seemed to plague almost every up-and-coming-act from that era. 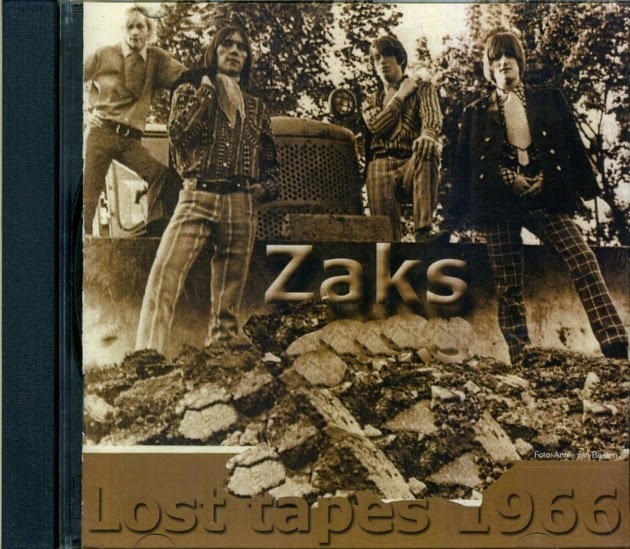 The Zaks had its origins in the remains of a Mexican-influenced instrumental band named Los Comancheros and a Shadows / beat-style combo named The Sunlights. THE SUNLIGHTS including Bjørnar Jørgensen (guitar) at the far right. Ronald Pedersen (b. Feb. the 4th 1948) had been playing lead-guitar in Los Comancheros since the early 60’s prior to forming another instrumental-band named The Spitfires, before quitting school and leaving for a trip around the world to toil on an ore-freighter in 1963 (Ronald maintained his axeman-skills by strumming a guitar in his cabin during the journey). 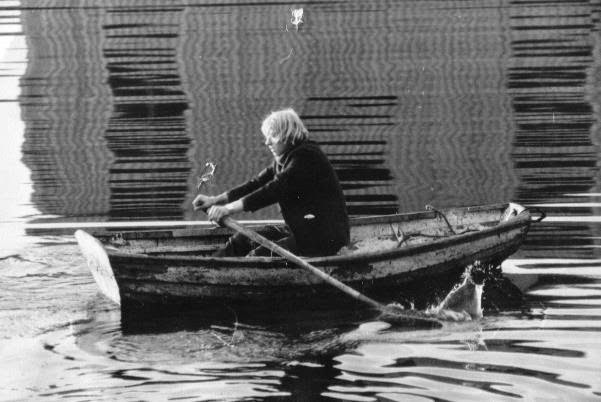 Following his return to Vardø a year later in 1964, he learned that Bjørnar Jørgensen (b. Feb. the 26th 1947 - the oldest and most experienced musician, having been a guitarist and later a drummer with The Sunlights) and Finn Pedersen (b. December the 5th 1947 - no relation to Ronald Pedersen) a talented young singer and rhythm-guitarist which Ronald had jammed with earlier before leaving town, and Svein “Løva” (“The Lion”) Andresen (b. Dec. the 11th 1949 - the youngest and most keen member on bass); had started a band with The Beatles and The Hollies and other British acts as their key influences. Ronald was eager for action again, and fell naturally into his previous function from his earlier bands as the solo-guitarist. Following firm rehearsals, the still nameless band started doing gigs at various local gatherings around the Northern Norwegian coast. 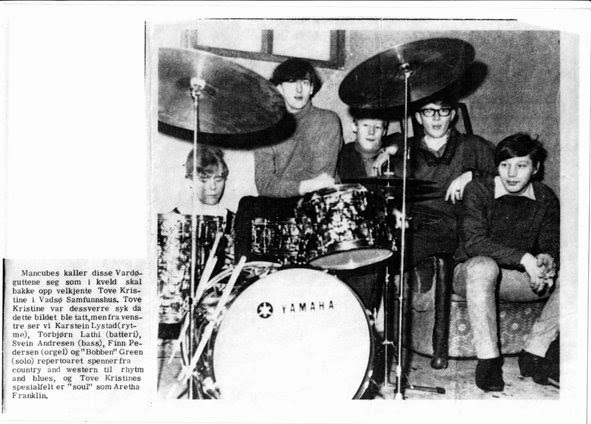 The christening of the unnamed band to “Zaks” (plural from Zak Starkey, after the then newborn son of Ringo Starr; and today a drummer of the current The Who-lineup), came up during a rehearsal in early 1965 after a suggestion from Svein Andresen. In addition, the band found out to their surprise that the word “zak” could also mean “robustness”, a “troll” or even “balls”; which they immediately felt fitted their brash and forceful musical approach perfectly. After having acquired a fitting moniker, The Zaks quickly started establishing themselves and their new-fangled brand-name. The Zaks, 1965. L-R: Bjørnar & Finn. 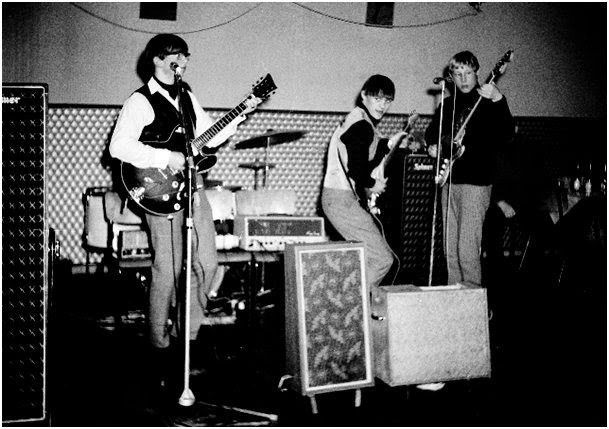 The Zaks live at Håntverkeren, Vardø in 1965. L-R: Finn Pedersen, Ronald Pedersen, and Svein Andresen. 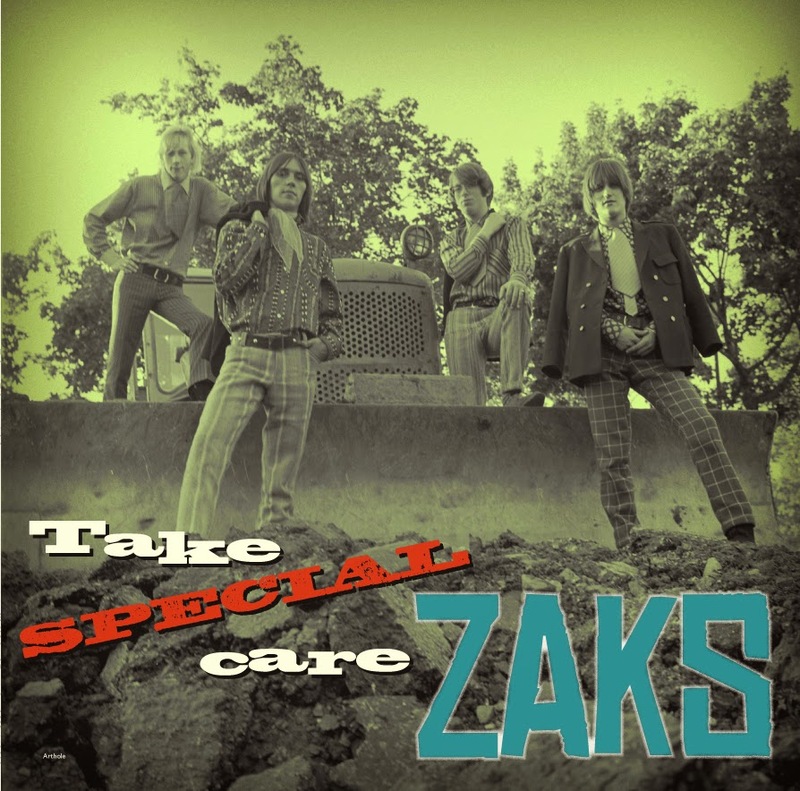 The Zaks was essentially an anomaly on a scene where most bands tended to go for replicas of top 10-hits and the like up-front. 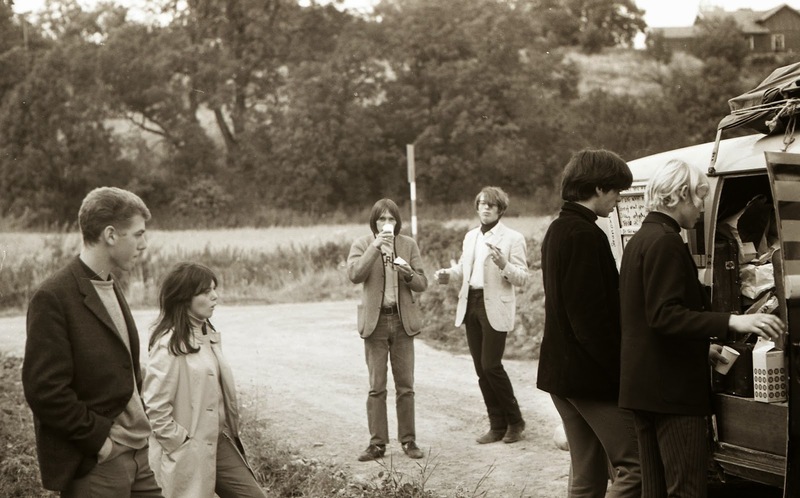 This was primarily because of their insistence of going straight for the throat of the audience with their own first-rate originals (The rule of thumb being that the composer of each song would also do the main vocals: “Not My Girl” and “Love Is Gone” for example, are both Finn’s laments over losing his girlfriend to his band-mate Ronald. 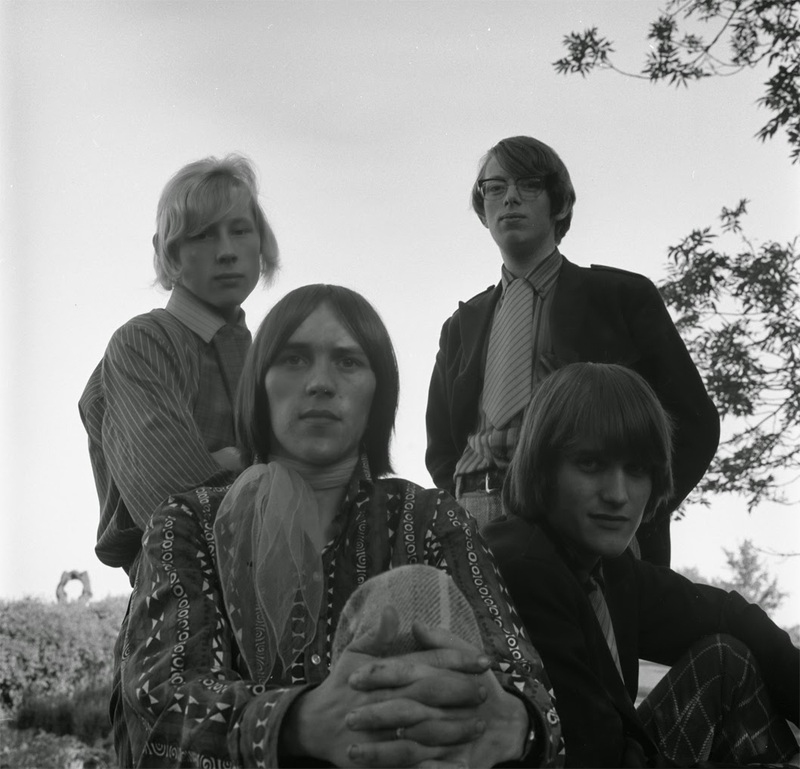 ), but also because all four members were talented singers as well as gifted and also (especially in Bjørnar’s and Ronald’s case); experienced musicians, and good at doing harmony; which by the time they recorded their sole 45 in September 1967, had reached the peak of perfection. The Zaks did of course have covers of UK-acts and even their arctic colleagues 1-2-6 (namely ”Graveyard Paradise”) up their sleeves like others, but that’s a trivial point in this context. The band was giving every non-original tune the ”Zaks-treatment”, re-molding and forging them according to their own tastes and approach. 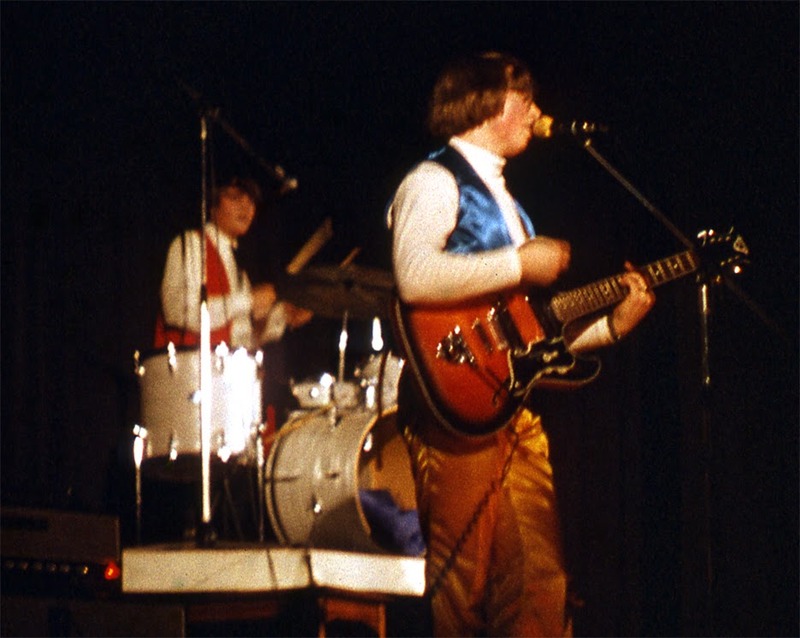 The Zaks was arguably one of the most well-travelled bands in Norway during the 60’s. 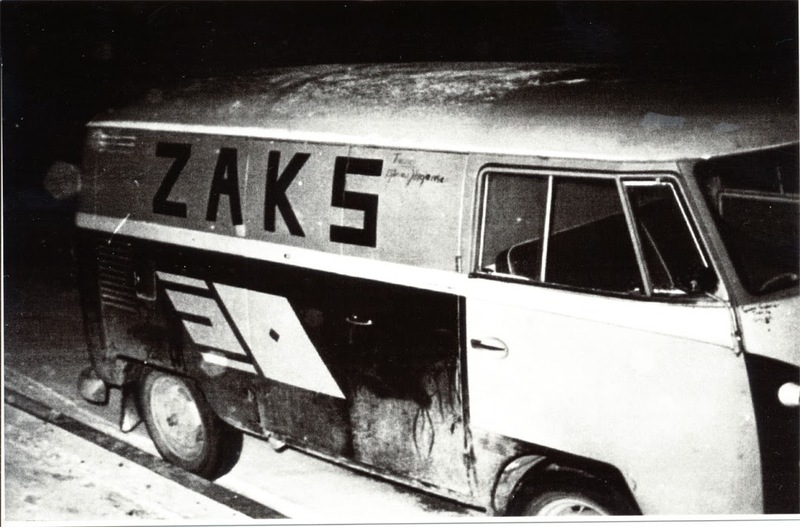 Always using their old Volkswagen-bus, the “Zaks-mobile” (with the logo of the band painted on both sides, along with Tove Kristine Eriksen’s) as a means to hike all over the coast and mainland. At the most, this car incredibly contained all four Zaks-members, plus Tove Kristine Eriksen, Bjørn Saastad and their loyal roadie, Svenn Edmund Olufsen, along with all their equipment. 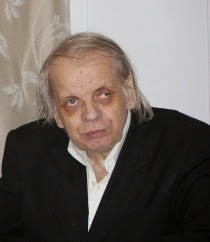 Svenn Edmund Olufsen (1947 – 2012) was an extremely resourceful friend of The Zaks who served as an all-around technician and “fixer” for the band from the very beginning to the bitter end. Affectionately nicknamed “the manager” by the group (a nickname he also shared with Saastad when he was around); Olufsen had an uncanny knack for supplying just about anything the band was in need of. Svenn was the man responsible for general maintenance and repair of gear; and also supplying the group with sellable merchandise, such as t-shirts and sweat-shirts in different colors and sizes complete with Zaks-logos designed by Olufsen himself. 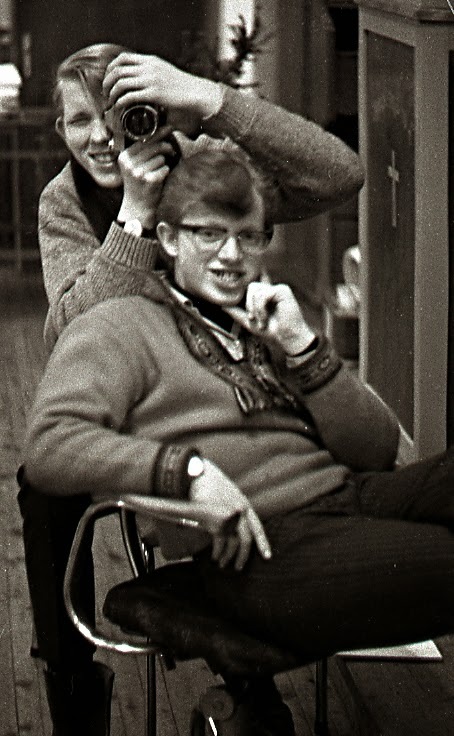 Bjørnar Jørgensen, and Ronald Pedersen. 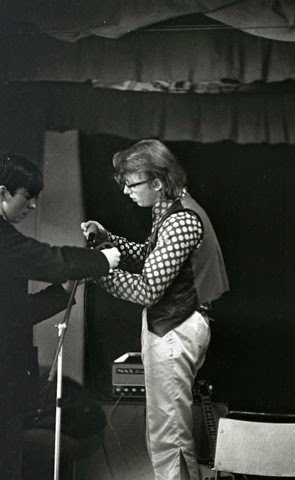 Most of those shirts were torn away by attendants at a particularly chaotic gig in Honningsvåg in 1966, where a frenzied, rock’n’roll-famished audience went totally “Zaksmania” on the group after a few numbers, climbing the stage and clawing up their clothes. The police, who were present at the gig, had to rush to the front of the stage and secure it, hence allowing the slightly stunned Zaks to finish up their concert for an out-of-control crowd. After the gig, the band found out to their surprise that all their Zaks-shirts had either been sold out or stolen during the turmoil. 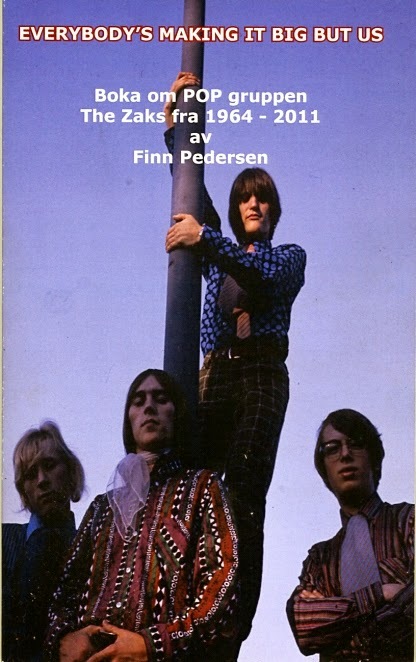 Apart from their innumerable concerts played around the surrounding coast and small towns; Finn, Ronald, Bjørnar, Svein, and Svenn also did a major nation-wide trip in the summer of 1967, deciding to do gigs along the way to pay for their expenses and provisions on a long haul down south to Oslo. The main goal of this particular tour of course, was to finally get to record their own 45 in a professional studio. Having played their last show of the downwards trip in Mosjøen, they travelled further on to Grong in Middle Norway, where Svein “Løva” Andresen debarked from the bus and travelled ahead by train to Oslo to meet up with his girlfriend (and later his wife) Tove Kristine Eriksen, while the rest of the entourage followed behind in the van. Tove Kristine had already proceeded down to Oslo in advance, due to concert-obligations. Above photos are all courtesy of Bjørn Saastad, who used to work as a "Radar Man" (or more precisely as a "Radar - technican") for the Air-Force in Honningsvåg, Norway back then. Honningsvåg hails as one of the most northern arctic small - towns in world. 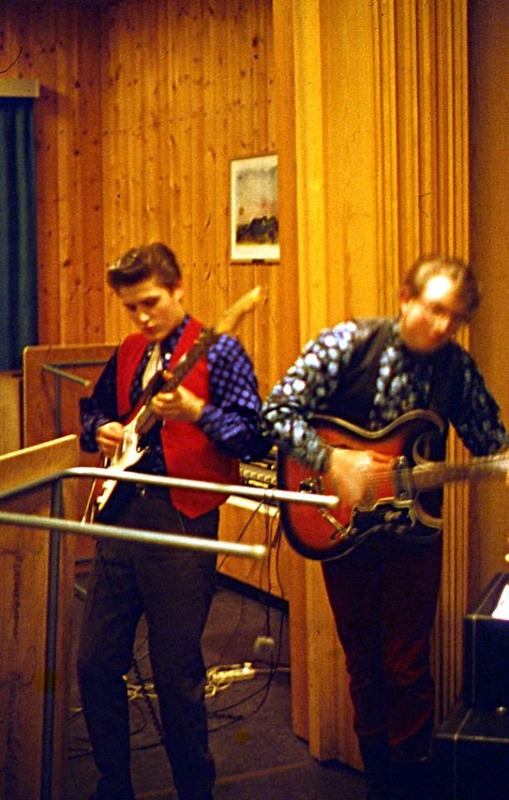 After a concert at Kino Honningsvåg in February, or March 1967, The Zaks and their equipment was taken up to the military base in Honningsvåg, where they've played another gig on the stage inside the dining room of the military base. This is where all the above photos were taken at. 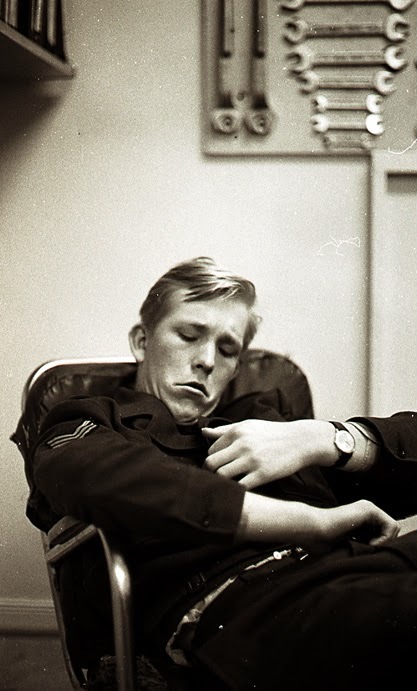 Afterwards the whole gang slept inside Bjørn Saastad's room at the military base. 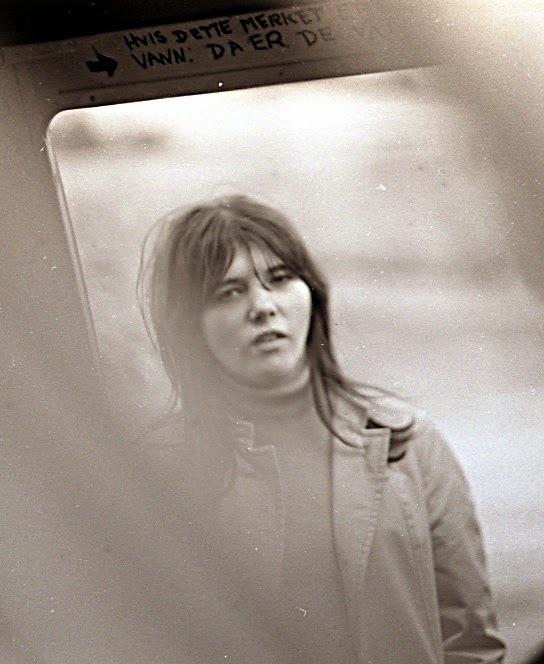 Tove Kristine Eriksen (1951 - 2000) was a chanteuse from Vardø who was considered as The Zaks’ fifth member. 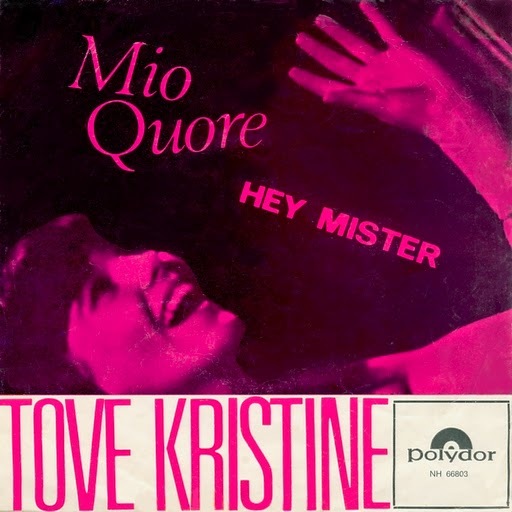 Already a fairly successful recording-artist by the age of 17 (she recorded three 45’s in the span from 1967 to 1969 under the moniker Tove Kristine on Polydor). Her first 45 “One Little Voice”, received fairly good attention, and even earned her a stint on National Television. 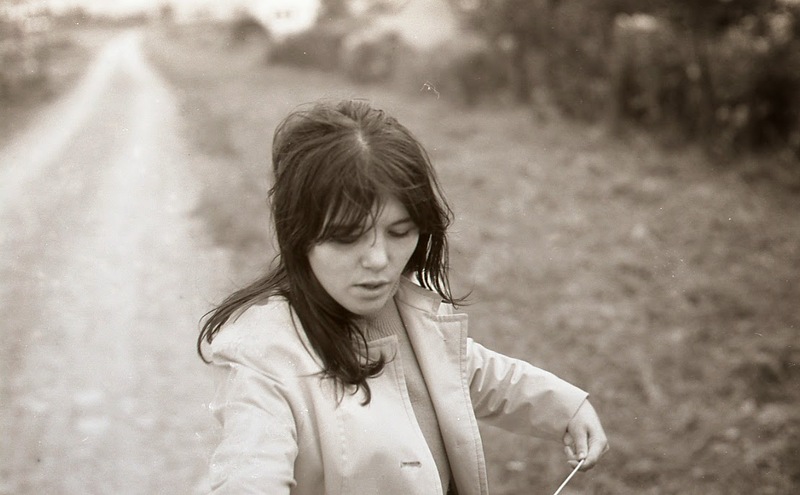 The band toured with; and shared the bill with her on numerous occasions on the arctic soil, before this longer spell in Drammen and the capitol of Oslo. Tove Kristine had struck up a deal with well-known producer and label-mogul Arne Bendiksen about recording her 2nd 45 that year for Polydor, and negotiated an agreement with Bendiksen about having The Zaks backing her up on her 45, and also managed to stipulate a condition in the contract that The Zaks would be able to record and release their own 45 as a good-will-gesture. After reaching their destination and hooking up with Andresen and Eriksen again, they first set up base in Bogstad Camping outside Oslo. 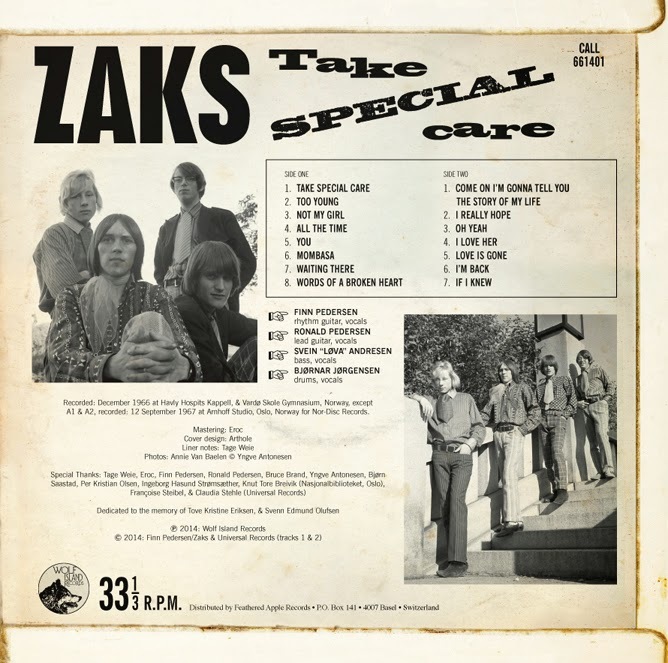 When someone in Drammen (a town just outside Oslo) were made aware about a rock’n’roll-combo dwelling at the camp-site, The Zaks were promptly invited to be the house-band at a club in Drammen named Casino Bar; doing shows there 3 nights a week. At Casino Bar, they were free to use the stage as a rehearsal-place, and used the establishment to try out new material as well; much to the thrill of the clientele. The Zaks’ popularity grew, and soon patrons were lining up outside the club just to see the combo (the opportunity to experience other contemporary colleagues playing in the locale, like The Firebeats Inc. was also an additional perk for The Zaks.). 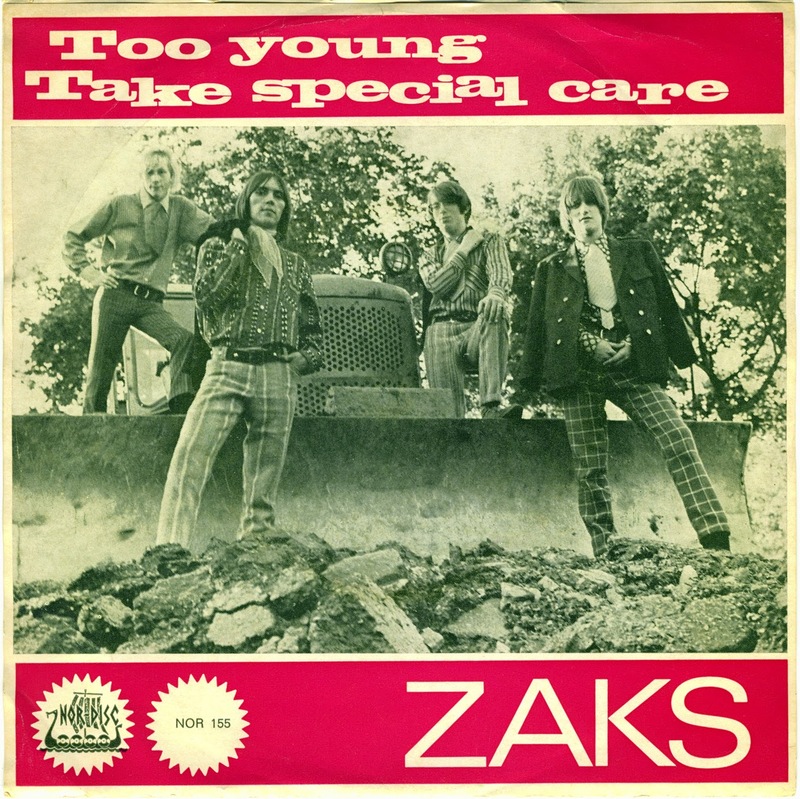 During this period, The Zaks’ reputation soared to such an extent that they were booked to do a concert at the internationally known, legendary counter-culture–arena Club 7 in Oslo. Club 7 also saw it fit to complement this particular show with scantily-clad go-go dancers gyrating in bathtubs behind them on stage, something the members refers to as a somewhat distracting but also very entertaining spectacle. The Zaks did of course run across other contemporaries during their travels (like the afore-mentioned The Firebeats Inc.), forming companionships, sharing experiences and tricks of the trade along the way. 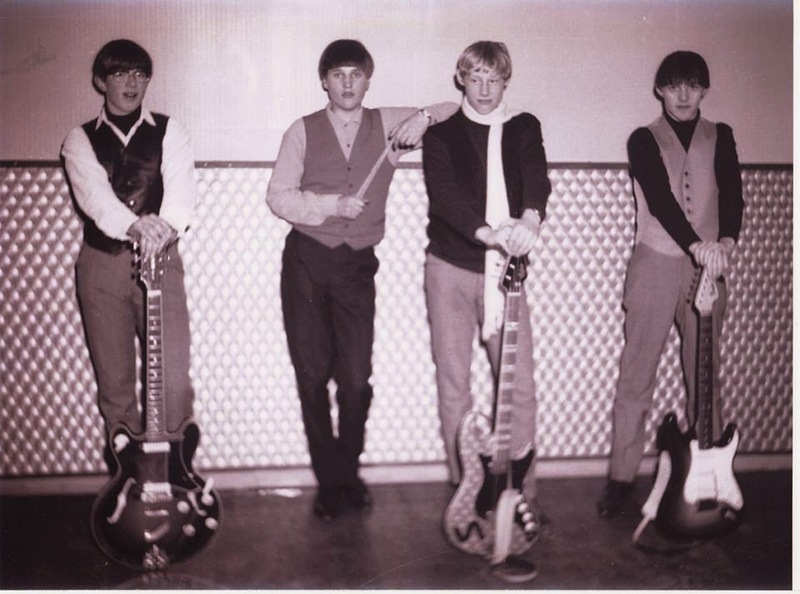 They also crossed paths with possibly the most well-known and biggest 60’s band in Norway, The Vanguards from Bærum. When supporting The Vanguards on an outdoor concert in Sylling outside Drammen; The Zaks, having left behind their somewhat meager PA at the Casino Bar in Drammen, asked if they could borrow the hugely successful and more expertly equipped colleagues PA, something their friendly rivals said yes to. During the concert, finding themselves plugged into a high-end mixing-board and finally getting the sound suitable and deserving of their choral and instrumental talents; The Zaks proceeded to blow their famous competition totally away. After The Zaks had finished their set, The Vanguards were intimidated off the stage after a few numbers because of the public’s incessant demands of getting The Zaks back on again. 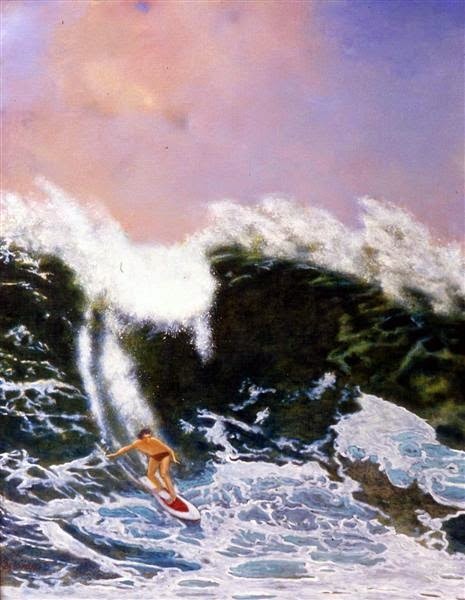 The Vanguards, chagrined by this humiliation; bluntly refused The Zaks to borrow the board any further; and grabbed it with them when they left. This was quickly alleviated when a couple of Zaks-fans drove over to the Casino Bar and fetched The Zaks’ own board so they could continue playing after a small hiatus, much to the attendants’ satisfaction. 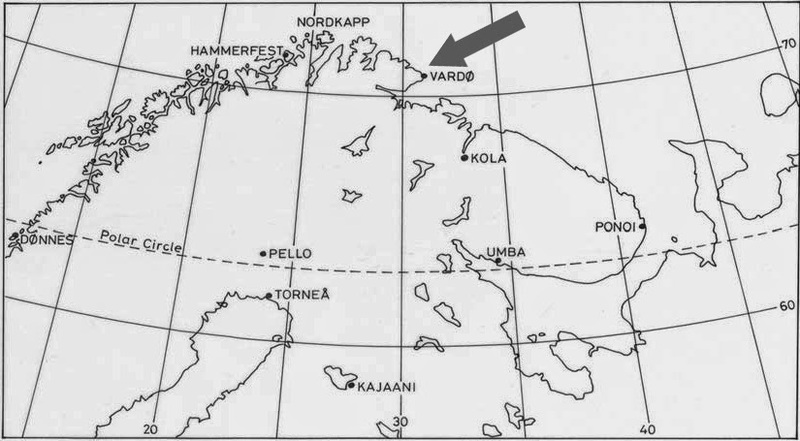 A similar incident had also occurred earlier in Vardø in 1966, when The Pussycats were jeered at and bombarded with yellings of “We Want The Zaks!” much to the hugely popular band’s bewilderment, who had absolutely no idea who or what the locals was yelling about. 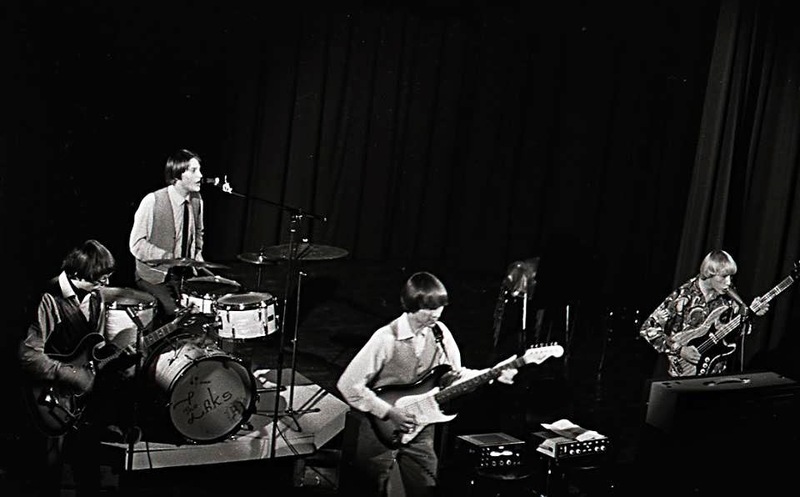 The Zaks live at Velferdshuset in Vardø, 1967. L-R: Bjørnar, and Finn. 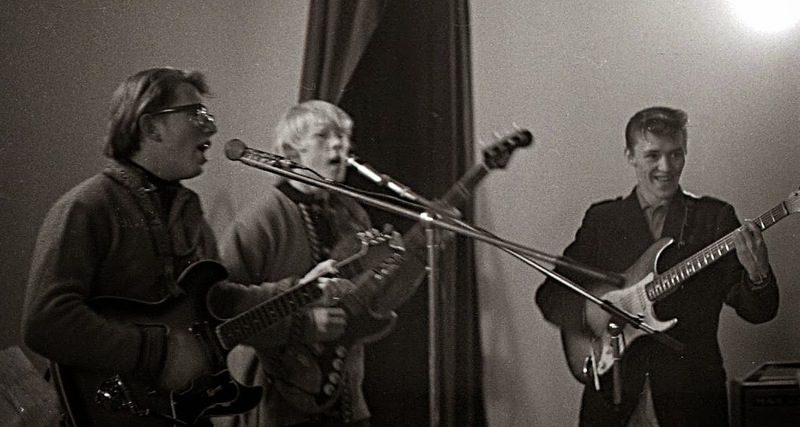 The Zaks live at Velferdshuset in Vardø, 1967. L-R: Ronald, and Svein. 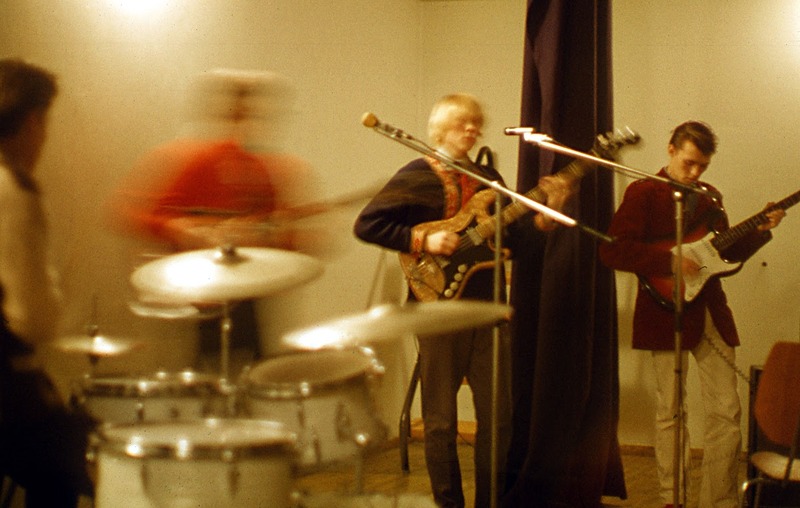 Eventually, after a long and hectic voyage, The Zaks and co. finally found themselves at Arnhoff Studio in Oslo, and started working on Tove Kristine’s 45 first; putting down “Mio Cuore” (a Mann/Weill-composition originally named “Heart” first recorded by Ken Chandler, but using Rita Pavone’s Italian version as a template) and “Hey Mister” (by Penn/Oldham; written for Sandy Posey). 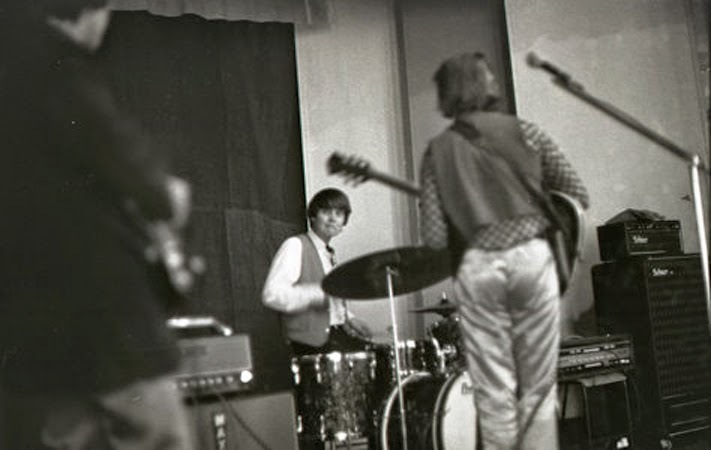 Having already picked out and readily rehearsed the two cuts they wanted to record in advance before going south, the gems “Take Special Care“ and ”Too Young” was recorded quickly; with the music-tracks laid down first, and the vocals added directly afterwards. Annie van Baelen; a renowned freelance-photographer who was often hired in by Bendiksen to do promotion-shots for his labels (she also did a great deal of work for various youth-oriented magazines), hauled Tove and the boys to the Frogner-park in Oslo for a photo-session. While shooting on location in the 45 hectares big area, they stumbled upon a part of the park where some landscaping was being done. 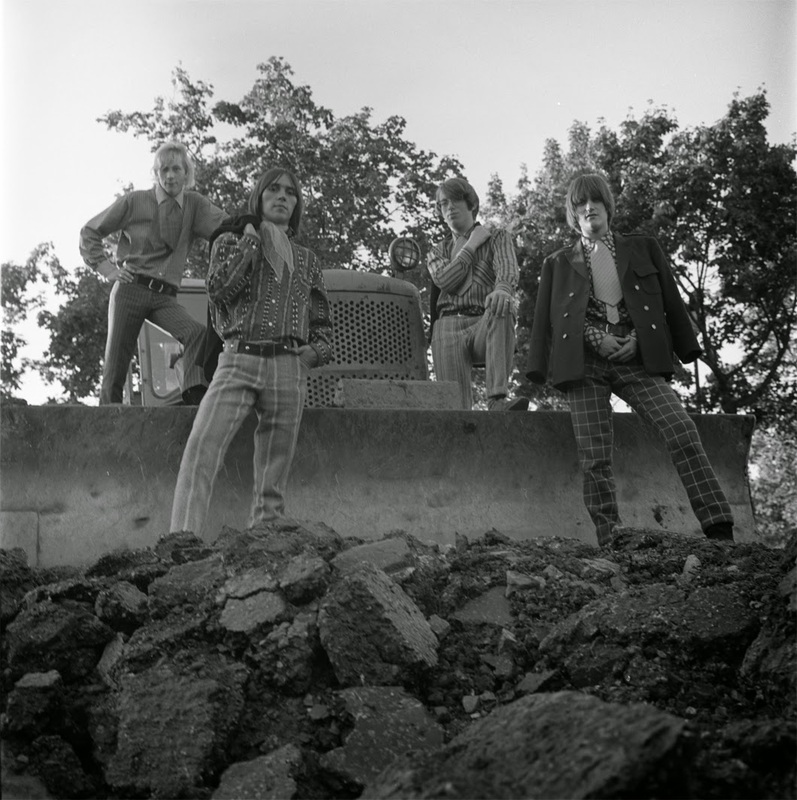 Van Baelen quickly saw a photo-opportunity by posing the members in front of an old bulldozer. Among the multitude of shots that were taken that day, - this particular image; with its unusual, almost threatening air; would be the one chosen to adorn the front of the now iconic picture sleeve to their 45. 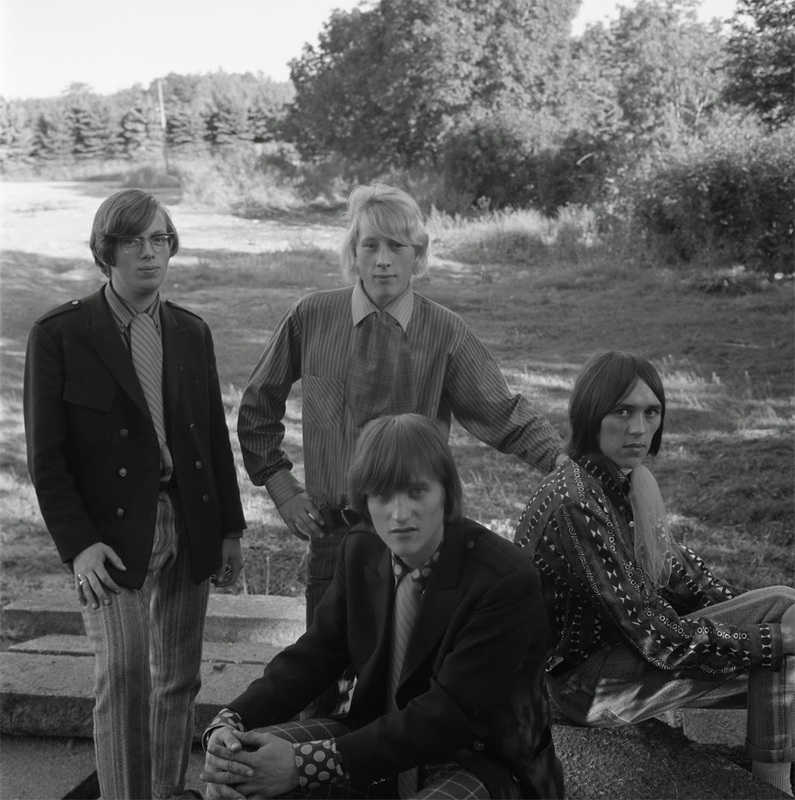 L-R: Svein "Løva" Andresen , Ronald Pedersen, Finn Pedersen, and Bjørnar Jørgensen. 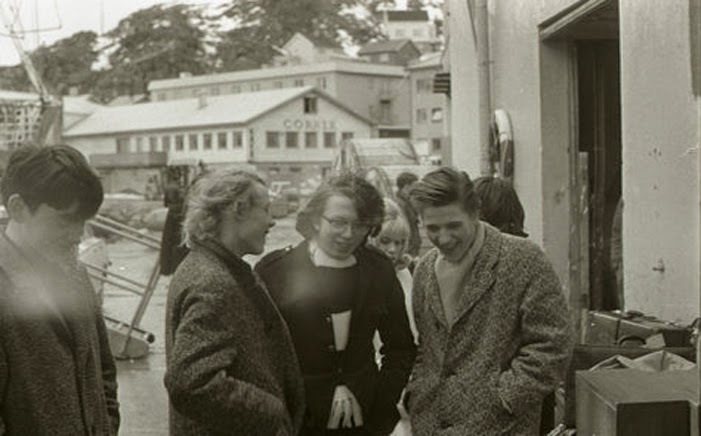 L-R: Svein "Løva" Andresen , Ronald Pedersen, Bjørnar Jørgensen, and Finn Pedersen. 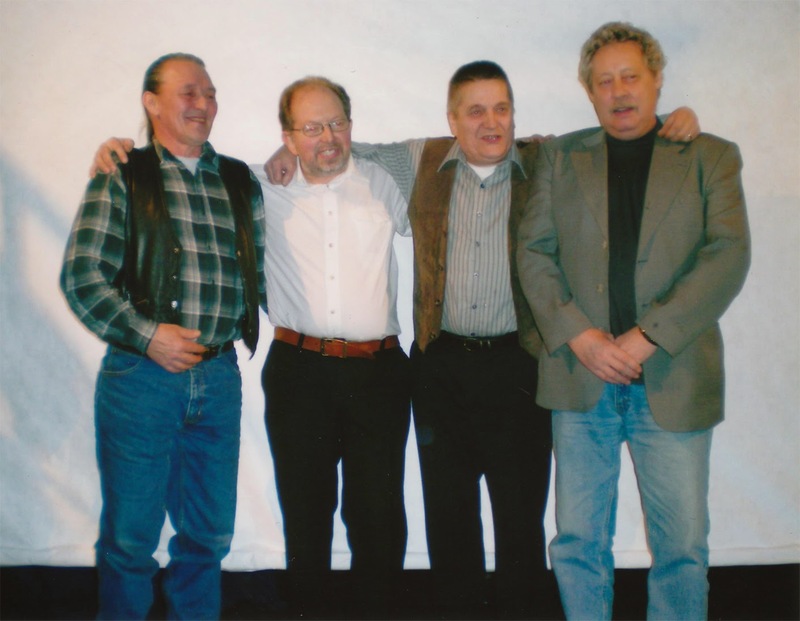 L-R: Finn Pedersen, Svein "Løva" Andresen, Finn Pedersen, and Ronald Pedersen. 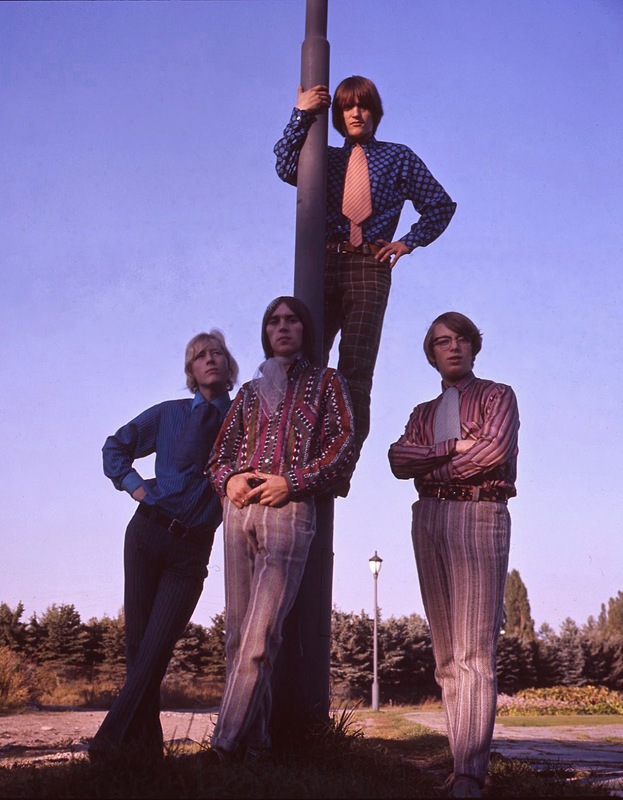 The Zaks 1967 photo-session at Frogner-Park, Oslo. L-R: Svein, Ronald, Bjørnar, and Finn. After having reached one of their primary goals, i.e. recorded a 45 (technically two); and finally starting to make a name for themselves among the public and their equals all over Norway, The Zaks’ future seemed to look bright indeed. 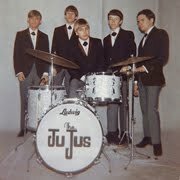 However, the years of intensive touring and playing country-wide on almost less than skimpy budgets had taken its toll. Not only on the five inhabitants in the cramped, old bus (Tove Kristine had stayed behind in Oslo for some upcoming gigs), but also on the car itself. Following an alarming incident when their van all of a sudden stalled in the middle of a railway crossing, the shook-up youngsters took it to a repair-shop, where they among other things were warned about a much-needed engine-repair, and that the vehicle would not be able to pass through a traffic-control in its current shape without losing its license plates. 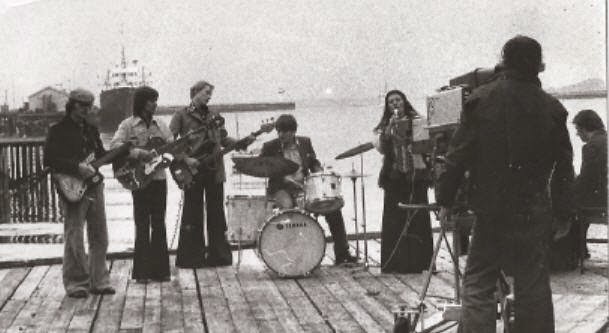 Because of sparse funds and the relatively high cost for the repairs, the band decided to take their chances on an easier route through Sweden via European route E45 on their way home to Northern Norway by night, to avoid the possibility of running into a traffic-control by day. 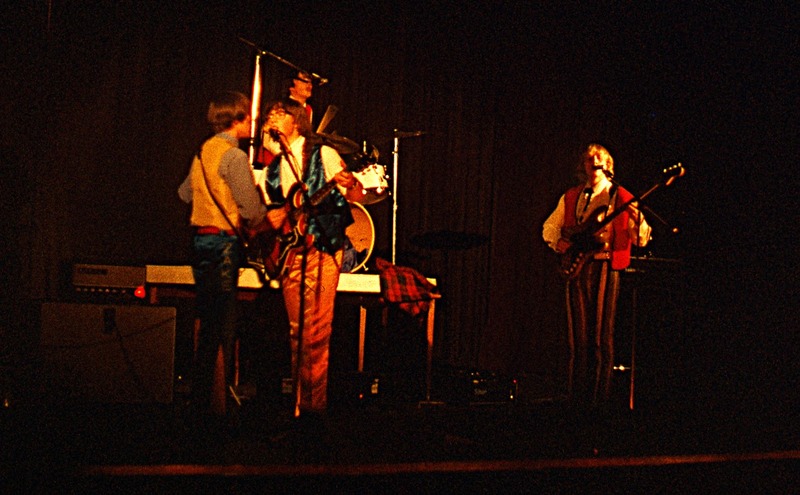 Personality clashes, different opinions and plans about the future, as well as discussions about a change of direction in musical styles had been prevalent amid the members’ for some time. After crossing the border, these ghosts from the past and discussions about future radio and TV-appearances were swiftly silenced, when their steadfast companion over the years, the “Zaks-mobile”, suddenly grinded to a halt near Orsa in Sweden. The earlier rash decision regarding crucial maintenance which had been waived off as a redundant extravagance, had now curved back on the group with a vengeance, and escalated into a full-blown disaster. The engine was now completely dead, and had to be replaced. Needless to say, the prize for replacing the whole motor was substantially higher than the previously mentioned un-heeded repairs. Consequently, the members had no other option than to phone back home to their parents for funds. When the car was deemed road-worthy again, the group continued their homewards journey in relative silence. Subsequently, after their arrival, they all decided to spend some time apart, to weigh their options and gather back their wits. The fall that year also saw the release of their eponymous 45, which was pressed in 300 copies and silently smuggled out through the back-door by Nor-Disc without any fanfare or promotion whatsoever. Disappointment over a failed commercial product combined with the lack of an experienced “real” manager to help put things into perspective, and the aforementioned personal factors, - was instrumental for the decision to do one last farewell-gig in their hometown the 26th of December later that year, and then call it quits. 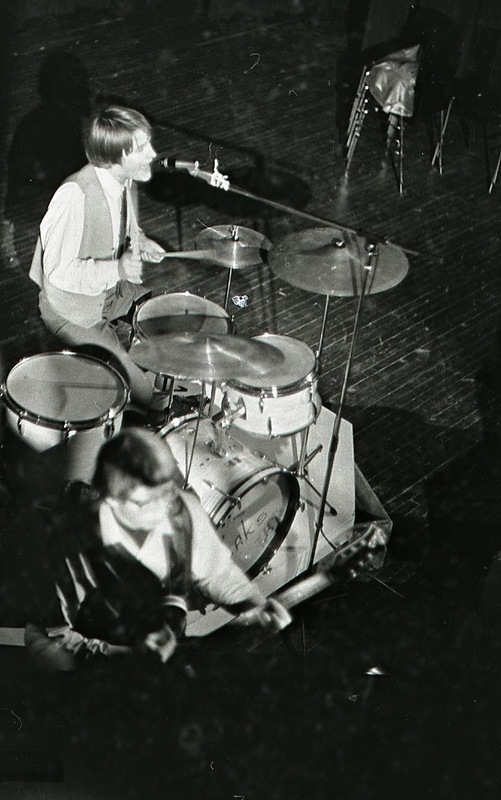 (Editorial note: The last gig of The Zaks was held at Velferdshuset in Vardo, where they would play into the early morning hours of December the 27th 1967. 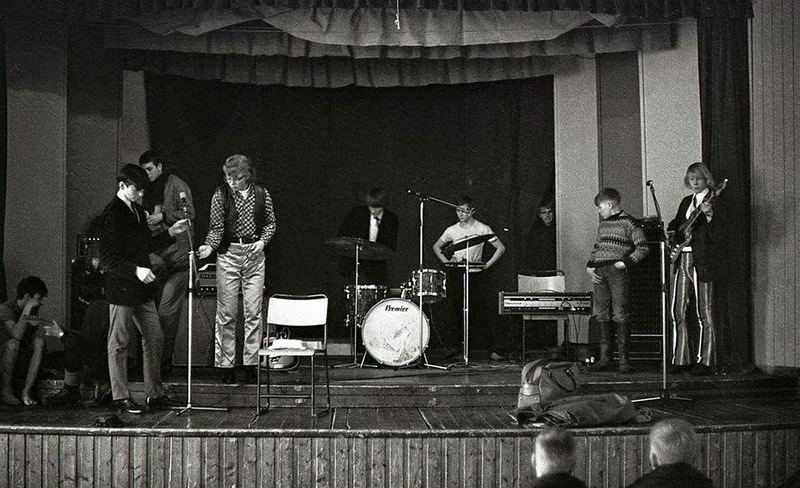 The Zaks between recordings at Gulskolen school gym, Vardø, Dec. 1966. L-R: Bjørnar, Svein, Finn, and Ronald. 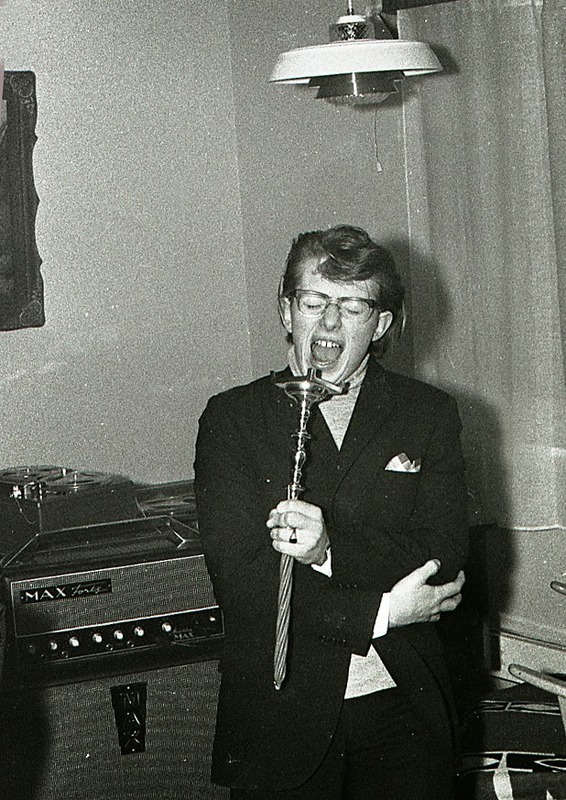 Svenn Edmund Olufsen had recorded at least 4 tapes of The Zaks since the launch of the band in 1964 and on later occasions, all of which are now considered irrefutably lost. 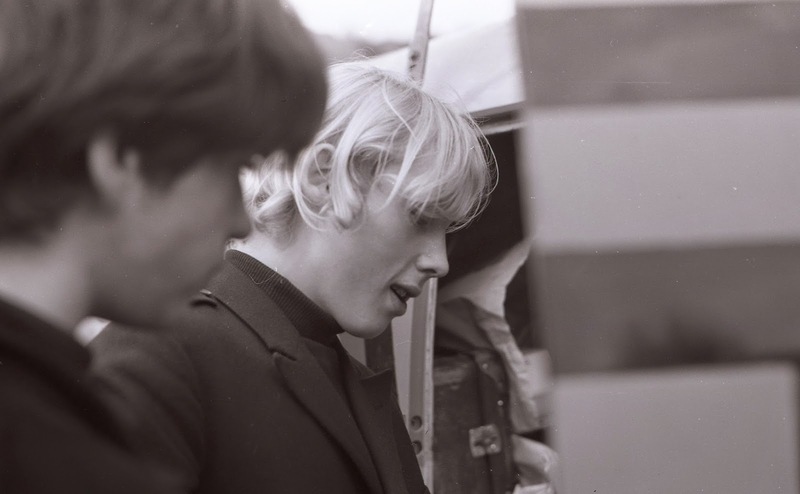 But in December 1966, a young man named Bjørn Saastad (b. 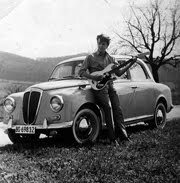 1946); which was stationed at the air force-base in the area; and who was their unofficial “manager”, annalist and a close friend of the band, recorded a demo-tape consisting of 18 tracks with a single mono-microphone lying on the floor into a Tandberg tape-recorder at their main rehearsal-place, the chapel at Havly Hostel, and further on in Vardø school gymnasium when the foreman of the parish wasn’t too happy about the rather unrefined teenage-sounds booming out of the congregation’s chapel at the hostel. 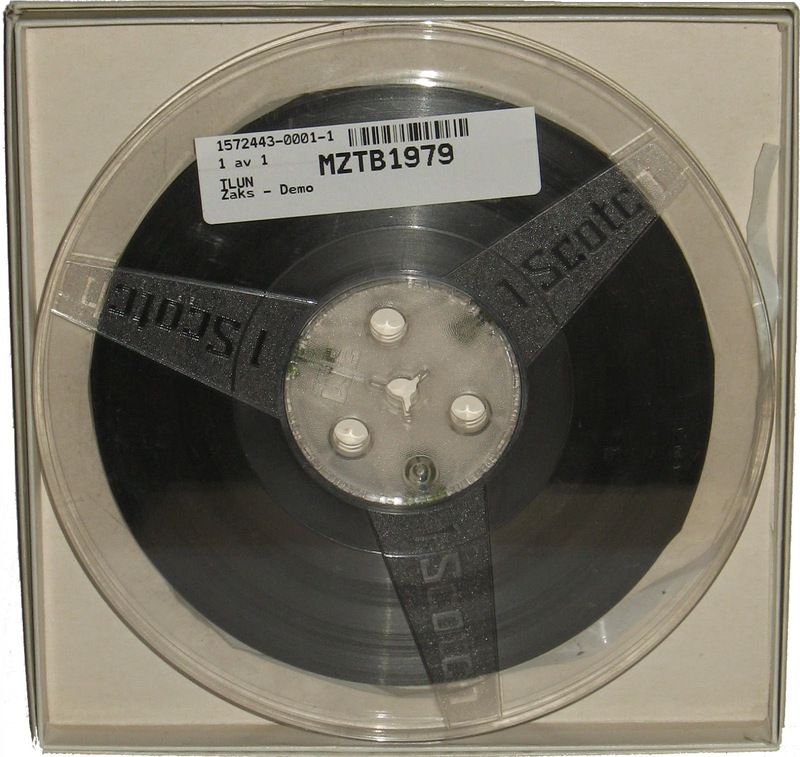 The tape had a spoken introduction from Jørgensen (fondly referred to by Finn Pedersen as the first voice-mail ever), and the tracks were presented by naming the title before each tune (these generic intros has been edited out for a better listening-experience here, of course). This was meant to be a representation and a proposal for the producer of The Vanguards, The Pussycats, The Mojo Blues, The Public Enemies, and many other Norwegian bands based in the South (even though The Pussycats originally hailed from Tromsø, the biggest town in The North), the legendary music-entrepreneur Svein Erik Børja, to try to get a record-deal. This tape, which only consisted of their own originals, were shipped to Børja, and quickly forgotten about by everyone involved for over 3 decades when no response or signals of interest was received. 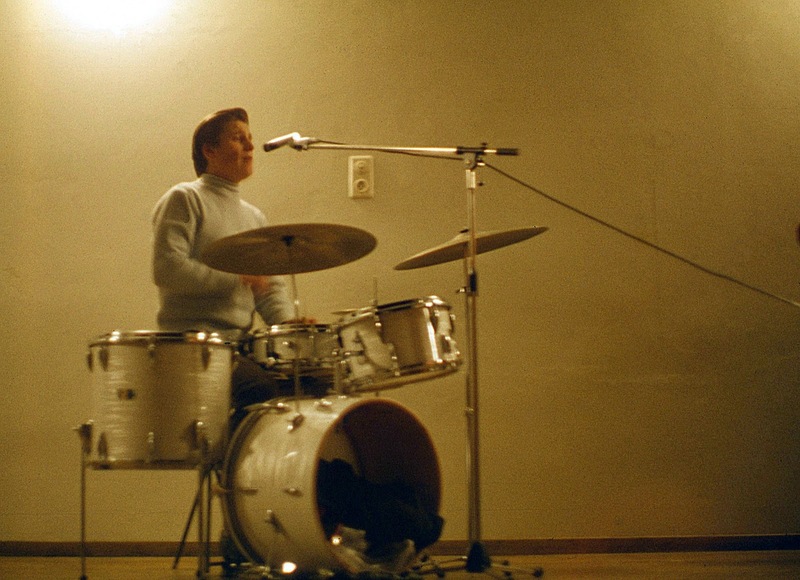 The Zaks during the recording of the "Lost Tapes" at Gulskolen school gym, Vardø, Dec. 1966. 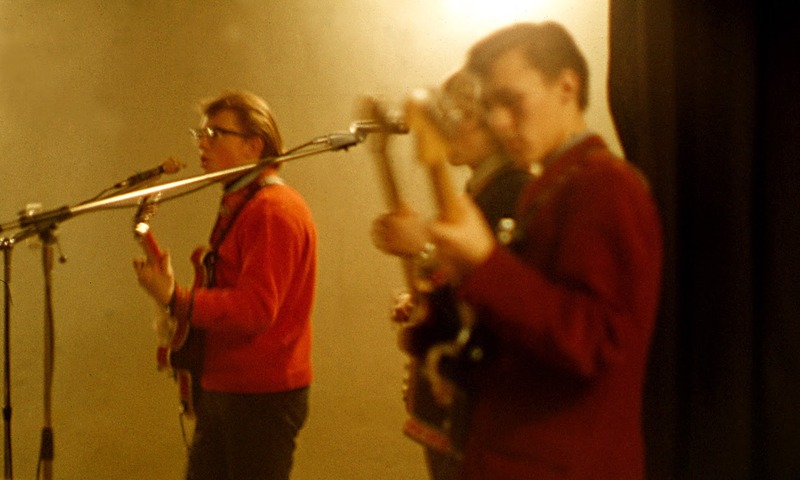 L-R: Bjørnar, Finn, Svein, and Ronald. 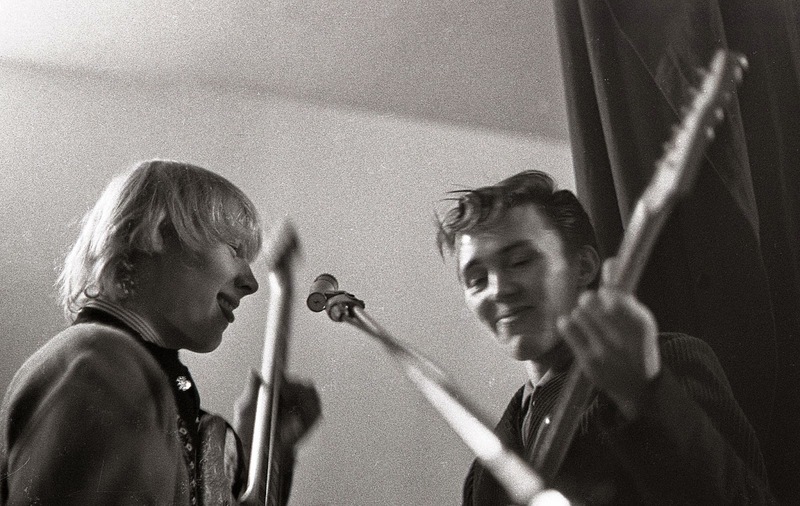 The Zaks during the recording of the "Lost Tapes" at Gulskolen school gym, Vardø, Dec. 1966. L-R: Finn, Svein, and Ronald. 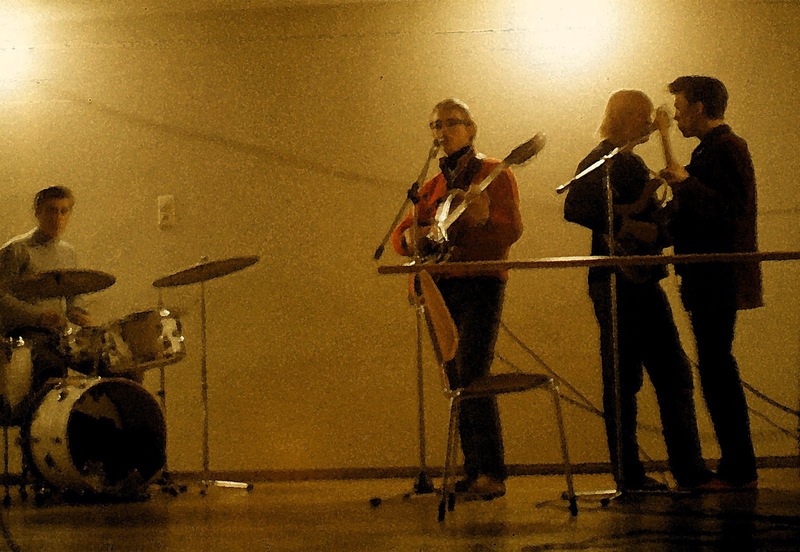 The Zaks during the recording of the "Lost Tapes" at Gulskolen school gym, in Vardø, Dec. 1966. 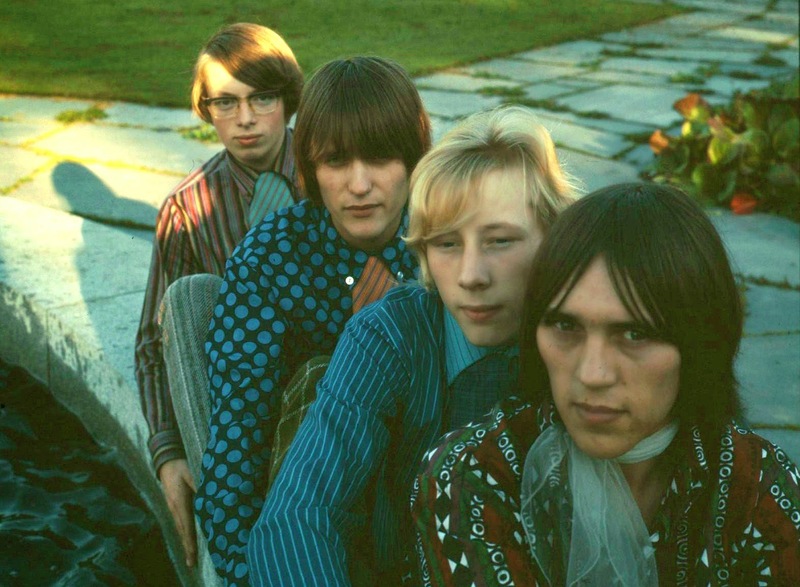 L-R: Bjørnar, Finn, Svein, and Ronald. 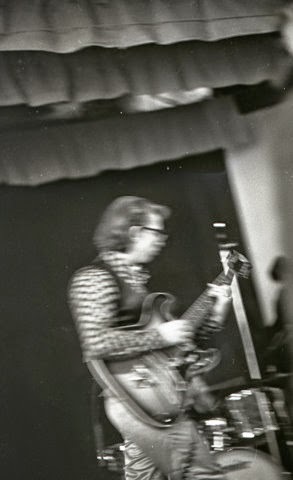 Finn Pedersen with his Burns, and Ronald's Fender Stratocaster between recordings at Gulskolen school gym in Vardø, Dec. 1966. 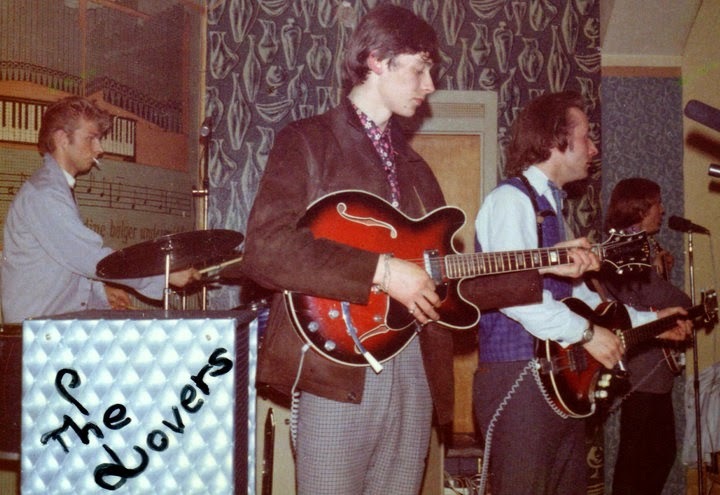 The Zaks during the recording the "Lost Tapes" at Havly sailor's home in December 1966. L-R: Finn, Svein, and Ronald. 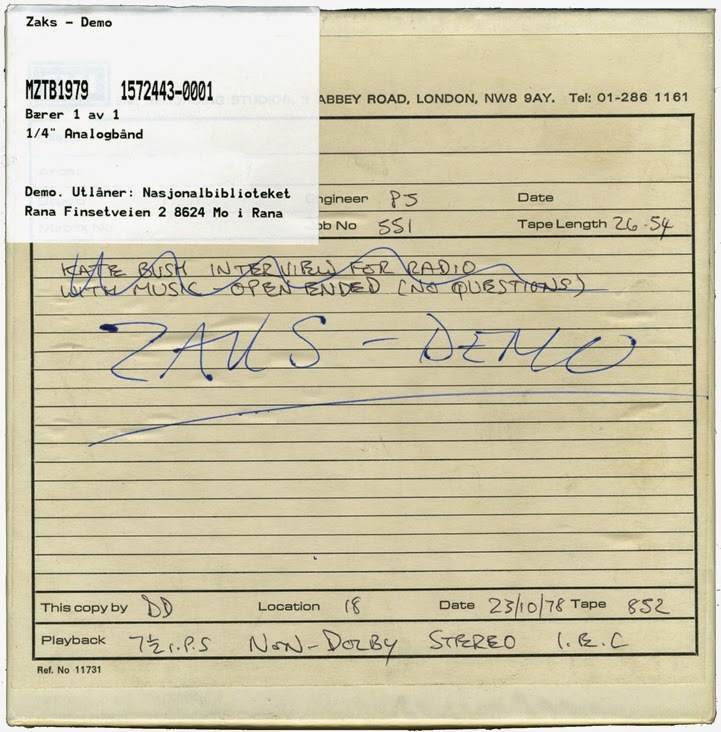 The Zaks during the recording the "Lost Tapes" at Havly sailor's home in December 1966. 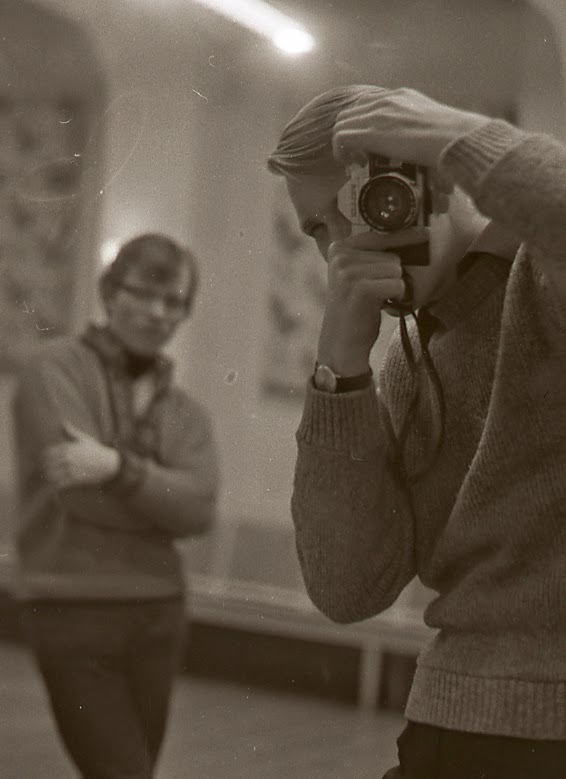 L-R:Svein Andresen, and Ronald Pedersen. Cue the year 2003, when journalist Per Kristian Olsen stumbled upon a 7th or 8th –generation cassette-tape while doing research for a TV-series about the history of Norwegian Rock. 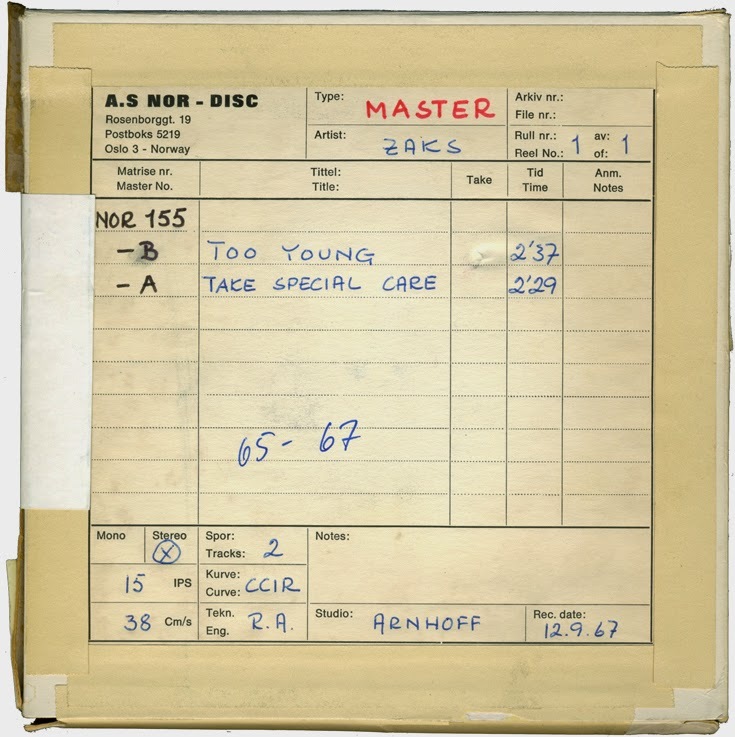 The tape consisted of 17 incredibly raw’n’rough-sounding demos; sounding like an unholy crossbreed between The Kinks, The Searchers et al, but possessing a more brutal, US-sounding tinge to it than the usual Mersey-like squeaks adopted by their regional and national ilk; and with so deteriorated sound-quality that it could easily have been mistaken for being recorded in the same desolate café in Texas where Randy Alvey And The Green Fuz recorded their seminal 45. 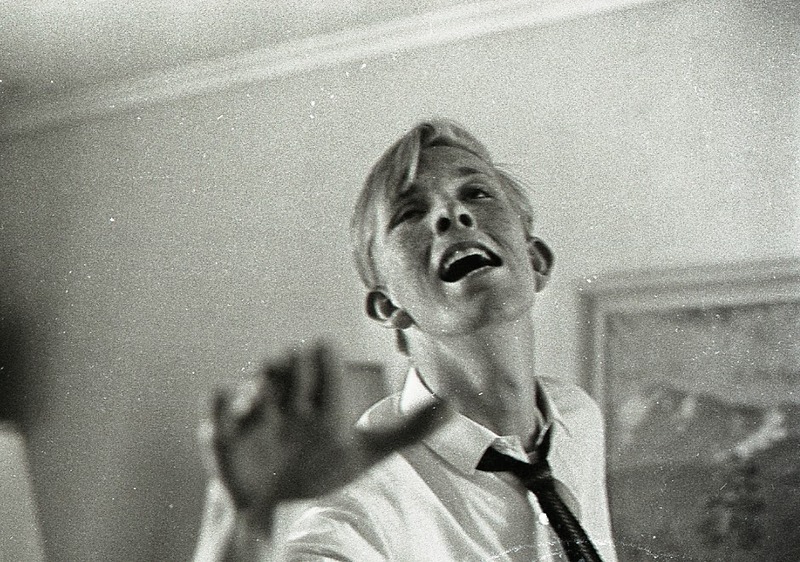 The material on the tape hailed from the then late and venerated music-journalist Arve Strømsæther, which at an earlier point had acquired the immense archives of the now also late Svein Erik Børja. Olsen then in turn delivered the tape over to No. 1 Zaks-devotee and close friend of the band, Yngve Antonesen. This tape was then returned back up North, much to the band-members astonishment. The tape was then digitally transferred and released in a limited quantity of only 300 signed CD’s and unleashed on the unsuspecting locals and the country’s collector-milieu in 2009. 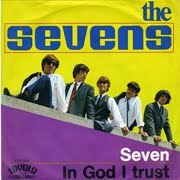 Even with its apparent inferior sound-quality, the excellence and the talent of everybody involved was stunningly obvious; and showed that The Zaks were just as adept at growling, menacing garage-numbers as they were at more melodic tunes which would have given bands like The Beau Brummels or The Squires a run for their money. Suddenly the awareness of the group started budding again. 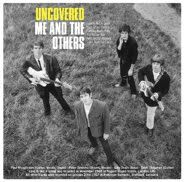 Articles and word of mouth about the band’s undeserved obscurity started to emerge, and the subject about where the original tape was hiding, or if it indeed was still in existence; came into question. Then in 2012, a dust-covered tape-box marked “ZAKS” was found stuck behind some previously emptied out shelves at Strømsæther’s home by his widow Ingeborg. Luckily, the names and addresses from some of the band-members were still attached to it, and after making some enquiries, she finally got in touch with Finn Pedersen. 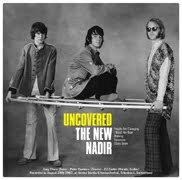 The rest as they say is history; and after a long and cumbersome trek, the music those ruffians from the North laid down in various locations in Vardø and Oslo during the 60’s is finally available the way it was meant to be appreciated, by a nowadays wider and more appreciative fan base. For a country with such a small and widespread population as Norway, almost every town or hamlet of the decade seemed to have one or more bands lurking about in the shadows. 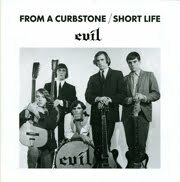 To cite Ronald Pedersen’s own words; they crossed paths with and witnessed a lot of really great local bands across the country that never made it, because of the then rampant monopoly that was enforced by the bigger labels and their owners, who was only interested in making money and keeping the sounds “nice and clean” and at a status quo. As a result, it was very hard to get a record-deal when straying from this template. Finn Pedersen also said that in hindsight, the missed opportunity to take a trip through the Mid-Norwegian Trøndelag-counties during their journeys was a huge mistake, as the sounds there were hard and tough (The Firestones, The Missing Links, The Zealotical Exceptions, etc. ), and could have been an easier way for The Zaks to get a permanent foot “inside the door”. 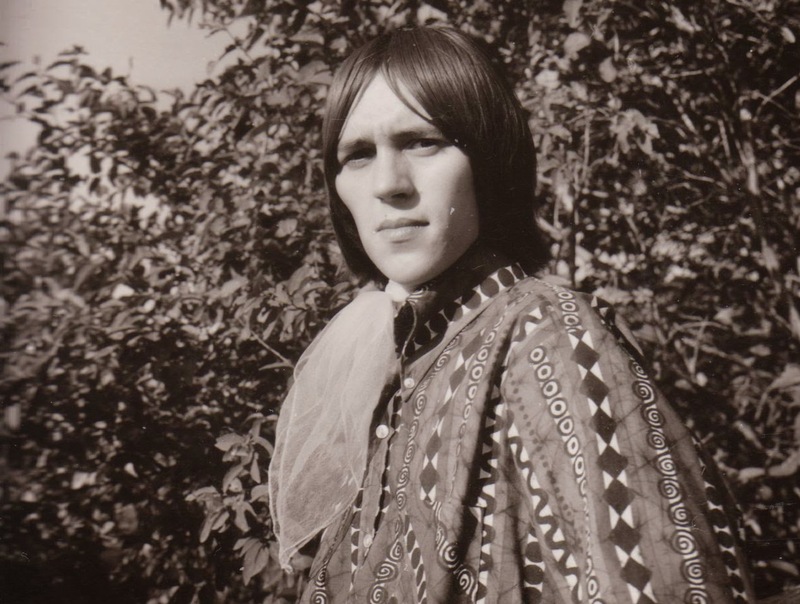 As an apropos, rumors also has it that there’s more Zaks-material out there somewhere, with more professional- sounding and louder production of original tunes recorded by Saastad shortly before his departure in early 1967. 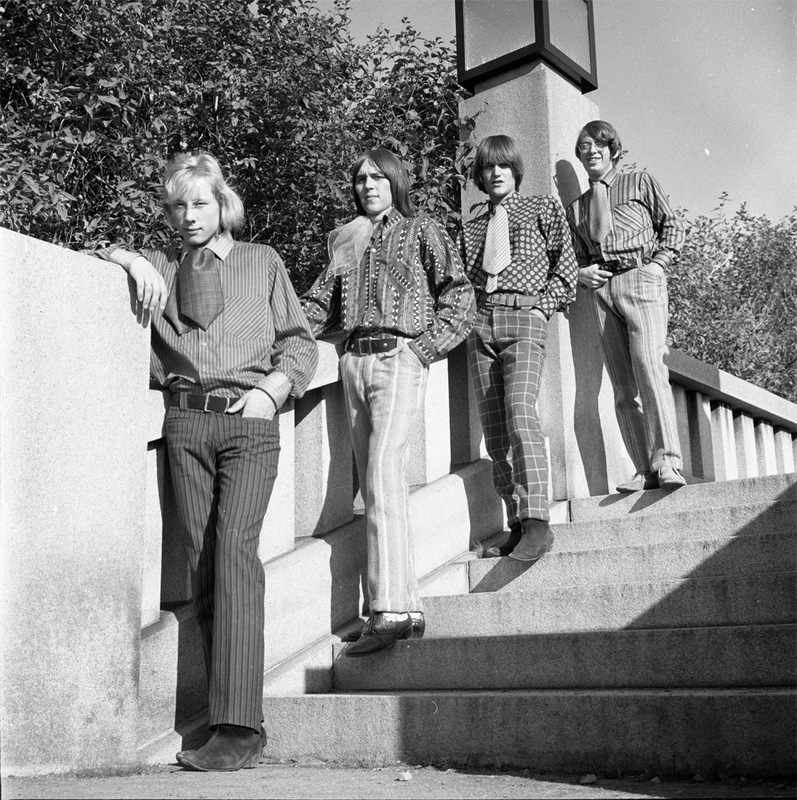 The Zaks 1967 photo-session at Frogner-Park, Oslo. 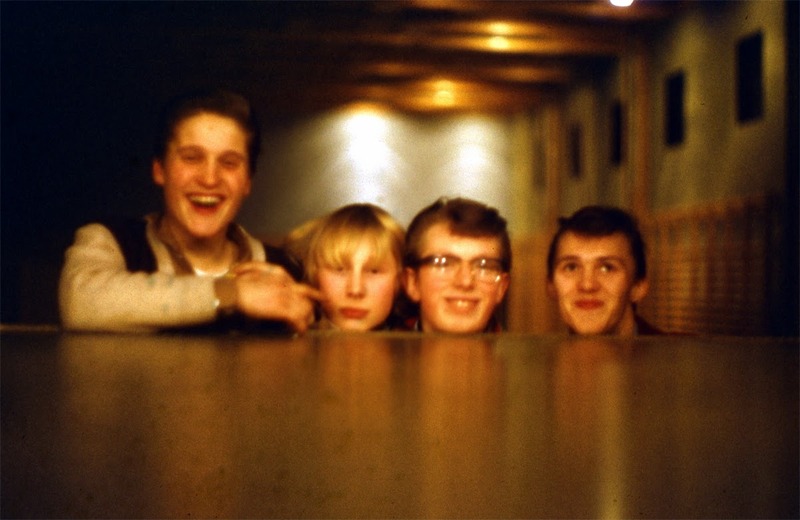 L-R: Bjørnar, Finn, Svein, and Ronald. 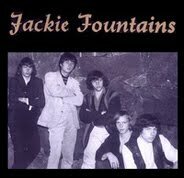 The Zaks saw a couple of reincarnations during the 70’s with some of the original members along with Tove Kristine Eriksen still present. Some of these line-ups went under monikers like “The New Zaks” and “Aquarius”. Tove Kristine and The Zaks filmed for NRK-TV in Vardø (Sept. 3. 1974) doing "Wann Kommst Du Wieder". 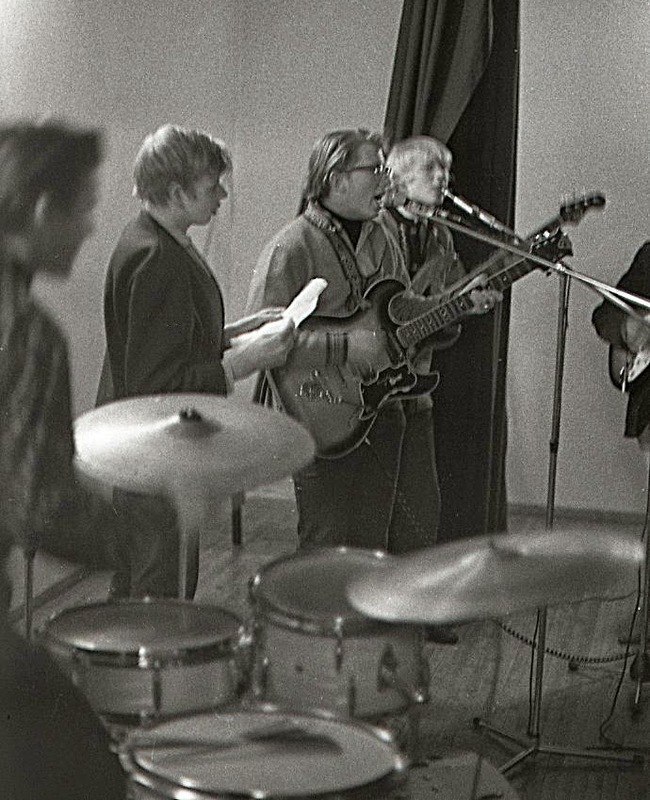 L-R: Leif H. Green (ex The Lovers), Ronald, Løva, Bjørnar, and Tove. The Zaks reunion in 2009. L-R: Ronald. Finn, Bjørnar, and Svein. Finn Pedersen worked in the IT–industry for many years after The Zaks. 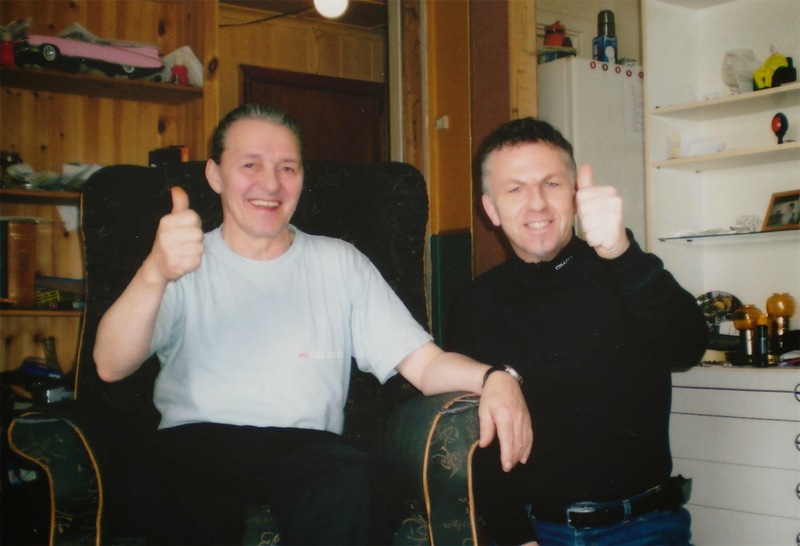 He is now retired and lives in Finnsnes, but is still active composing music. He is also the author of a book about The Zaks, “Everybody’s making it big but us” (2011) which has been an exceptionally valuable source for these liner-notes. Ronald Pedersen took up labor as a building worker, and was part of a crew that demolished The Zaks’ previous haunt Havly Hostel which was then rebuilt into drunk-tanks for the local police. He is now retired, but is still active as a musician in Vardø. Bjørnar Jørgensen worked in the postal service for many years, and also tried his hand as a store-owner. 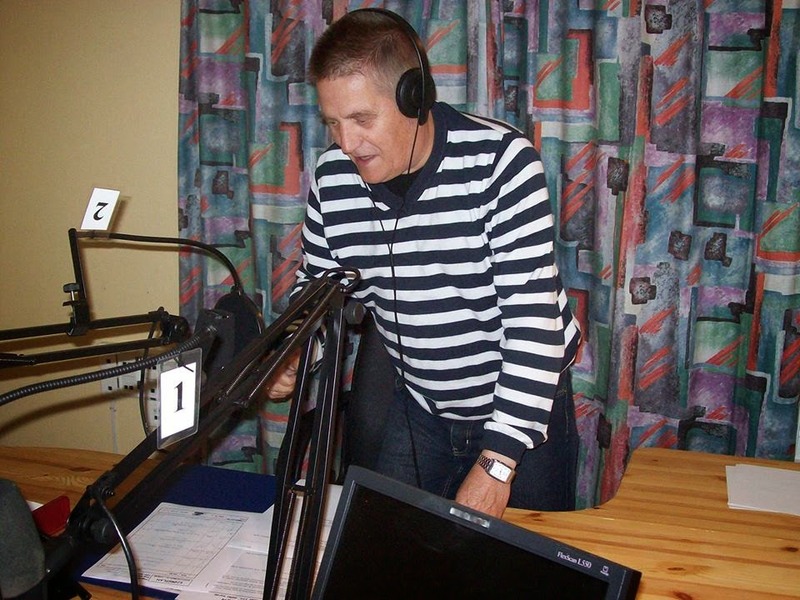 He is also retired, but can be found in the position as the editor-in-chief of the local radio in Vardø. Svein “Løva” Andresen went for a career in the Air Force before retiring in 2013, but is known to pick up his guitar on occasions. He lives in Vardø. Tove Kristine Eriksen later moved to Sweden before relocating to Vardø again. She passed away in 2000. Svenn Edmund Olufsen passed away in 2012 after dedicating his life to local politics in Vardø following his tenure with The Zaks. 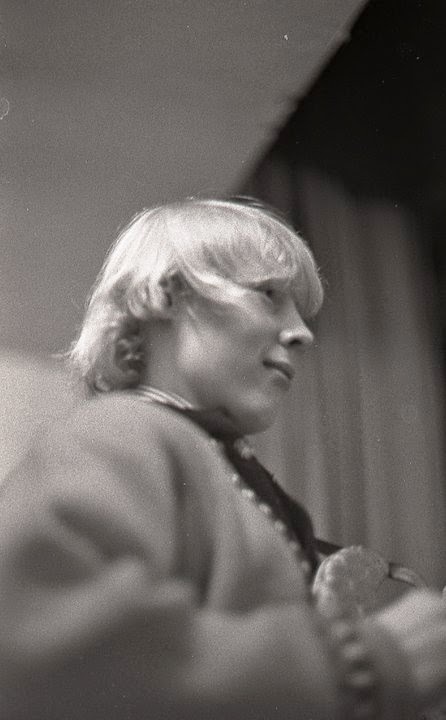 Bjørn Saastad said adieu to The Zaks when he was transferred in early 1967. 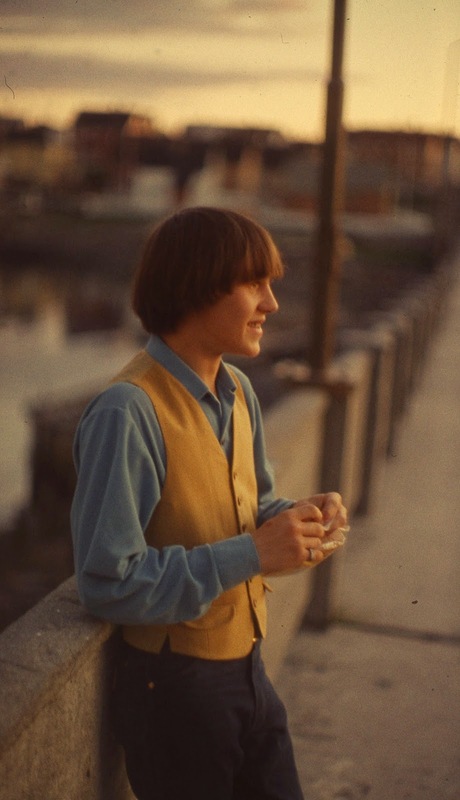 After his discharge from the air force, he travelled around the US in the early 70’s, documenting the journeys of various Midwest bands (The Tongue, etc) as he had previously done with The Zaks. 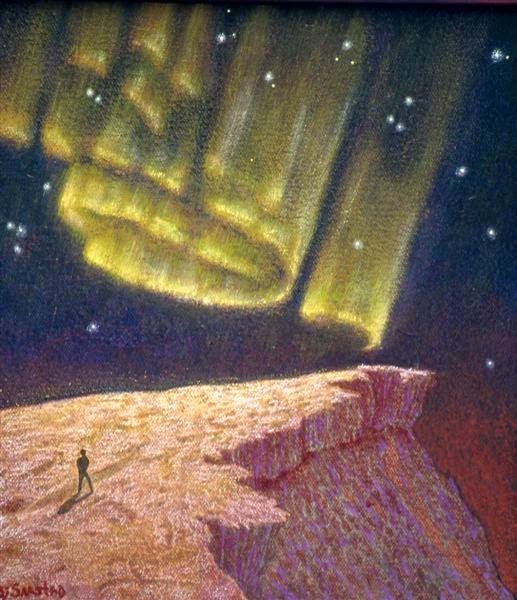 He lives in Oslo, and is today a highly regarded graphic artist. (This privately released CD got mastered from a poor sounding 8th generation cassette copy of the "Lost Tape." 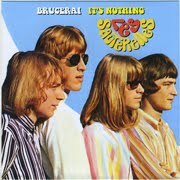 It was released at Svein's 60th birthday, back on December 11. 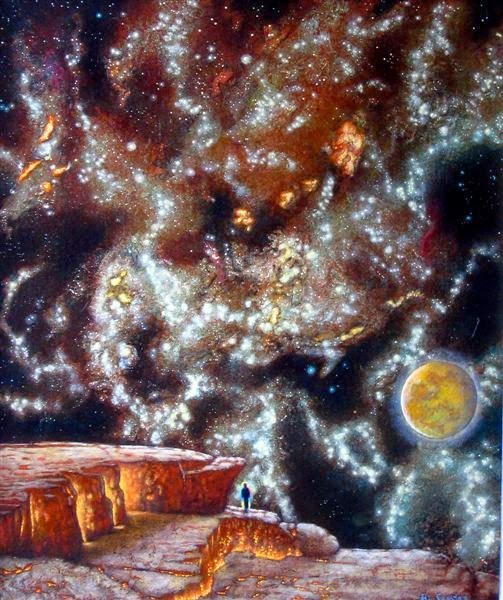 2009, in a limited collectors edition of 300 signed, and numbered copies. 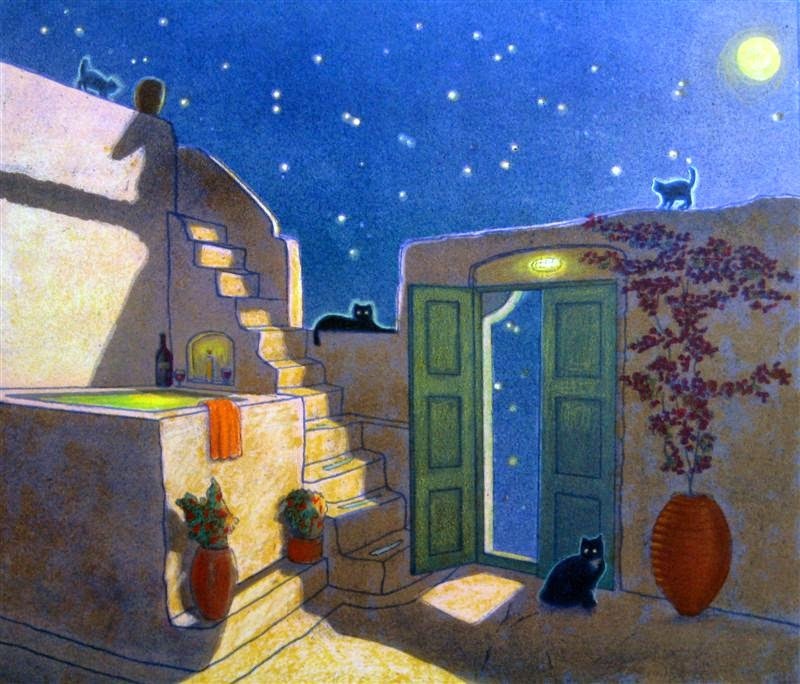 Time is not always kind to reality of things that happened a long time ago. I must say that I have not received much credit for the story of The Zaks. Nobody took a serious contact with me regarding the tape recordings, and all the work around it. 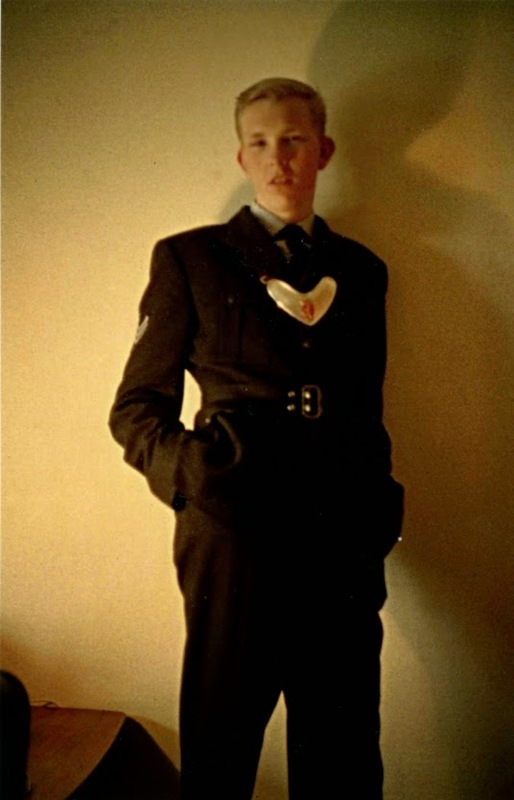 I was highly educated in electronics in the Norvegian airforce. When I came to Vardø in April 1966 I was 19 and a half years old. I was a radar specialist on Marconi Early Warning systems. The big radars that Nato used to observe the airspace from Turkey to the Russian border. I had been headhunted by the Americans that had an operation in Vardø. It was obligatory to work 2 years maintaining the radars as a payback. After 6 months I moved from Vardø to Honningsvåg, the island where the Nortcape is - a 24 hour one way trip with the old "Hurtigruten - coastal ferry." I used my summer and christmas holidays to make the recordings, traveling 2 times up and down the coast. I bought the newest, and most expensive Tandberg 4 track reel to reel tape recorder with sound on sound system. I also bought some Goodman hi-fi speakers for the voices in particular. On the speakers you could tune directly to get more or less crispy sounds. I had done a lot of research on how to place microphones - acoustic angles and so forth. Bjørn Saastad as a preacher, talking about the huge future success of The Zaks to some local weirdos from Vardø in ca. 1967. We've recorded 3 tunes per day. The tape was sent on January 22. 1967 to Svein Erik Børja. I tried to call him on February 15. 1967, but no reponse. I wrote a letter to The Zaks on March 20. 1967 where I told them that I was fed up, mostly because of lending them some money that never came back. Inside the envelope with the tape I've put return stamps, and emphasized that it was of the utmost importance that the tape was sent back if there was no interest. Just to be mentioned as one little helper on the way, is not true to the history. Without my money, my equipment, and enthousiasm an involvement I'd say nothing would been happening. And at last: The tape was mine - I've paid for it - I owned it - it was my property - there were never a question about this. I am of course happy of the destiny of the recordings, but some truth of what actually happened might now come to the surface. "Not My Girl" was written by Bjørnar Jørgensen, and I have never lost any girlfriend to Ronald. All the four of us were singing. Lead singer on most of the songs was Bjørnar, and me - since we wrote almost all of the songs. I dont think that Bjørn Saastad was travelling with us, but Tor Ebeltoft was. Please note that all the text from this blog was written by us, or especially by the band members for us. 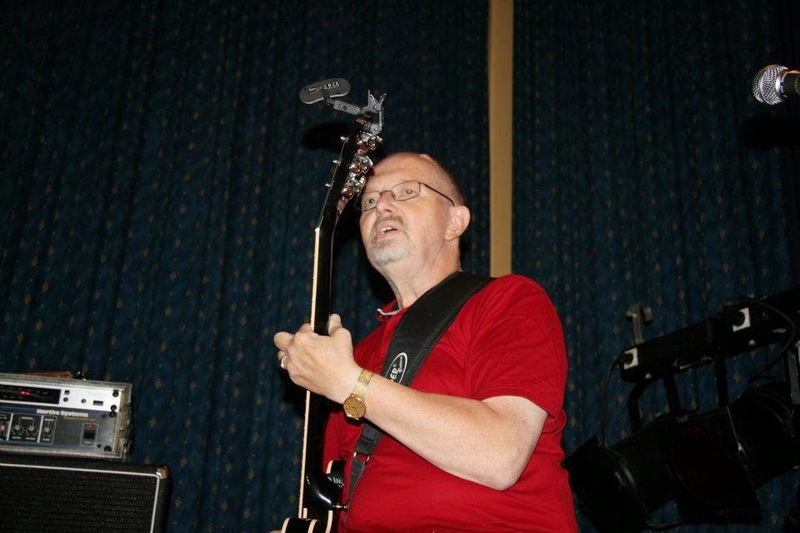 Our Scotch beat buddy Lenny Helsing of The Thanes has helped to edit most of the band members text. Everything else that is not credited yet was written by me (Down The Line). Believe it or not, but we've actually worked for over 10 years on some of the band bios featured. You can actually rely in the info from our blog! The photos from our blog all hail from either my personal photo archive, or from the band members collections. We still have to finish adding the proper photo credits onto some of them. They will be added with time. A few of the photo's (that we've all used with permission) would be involving money to license from their respective owners. We've actually had to pay cash for the licensing of some of them ourselves! You will have to ask for our written OK in advance in order to use, or reprint any of the text, info, or photos from this blog. So, all that you will basically have to do will be to write us for our OK (just leave a feedback together with your return email, and don't worry we won't publish your feedback). We will most likely be happy to help!! We would even have a lot more material from most of the bands available, so just be friendly and ask! We've helped several music journalists, and music fans in the past, and will be happy to support them in future too.. 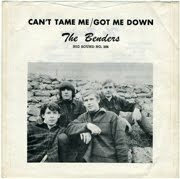 THE BENDERS - CAN'T TAME ME original or bootleg? 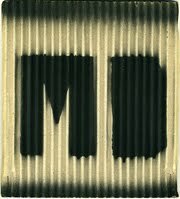 MANISCH DEPRESSIV - MD original,or bootleg?